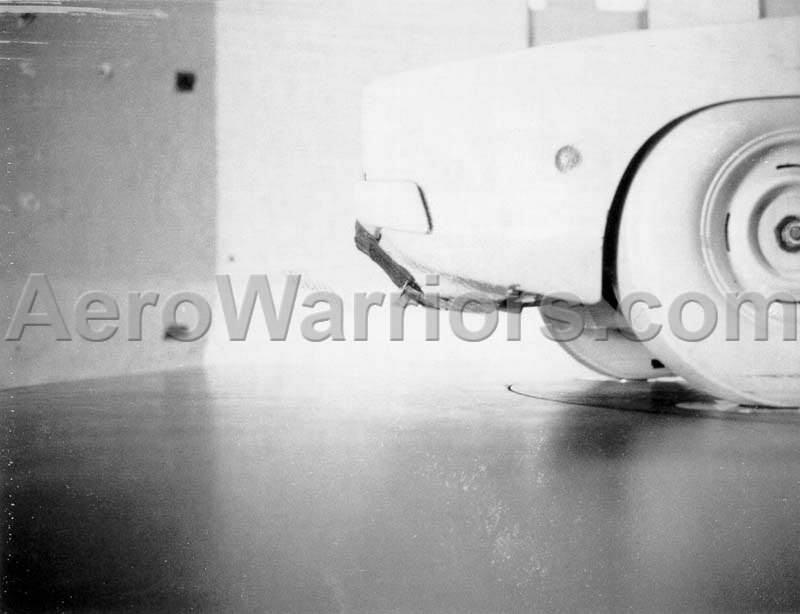 Chrysler employee, winged car aficionado and Chrysler memorabilia collector Greg Kwiatkowski has made available, from his private collection, several rare images for display on the Aero Warriors site (some never before seen publicly). A 19 MB zip file of all MPEG videos found on this page is available for download. Where a video comes in both 176x112 and 352x240 pixel sizes, the zip package will contain only the larger 352x240 pixel capture. 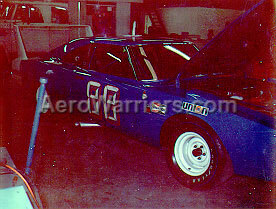 Chrysler's decision to all but abandon NASCAR competition for the 1971 season left only two cars with any significant factory support, the Petty Enterprises' racers. As the story goes, this didn't set well with Nord Krauskopf, owner of the K&K Insurance team - the 1970 Grand National Champions. 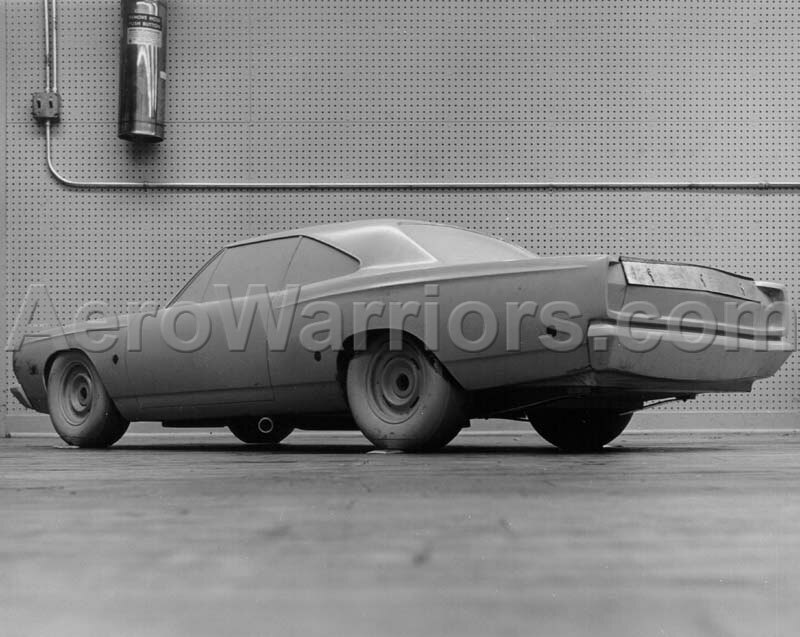 So, to send a message to Chrysler that perhaps they should have shown more interest in the very capable (and deserving) K&K group, the team headed off to the Bonneville Salt Flats in Utah to take a shot at some land speed records. After spending September 13-16, 1971 on the salt, Krauskopf, crew chief Harry Hyde, driver Bobby Isaac and the rest of the team had claimed 28 world records! The 84 seconds of extraordinary footage found here provides a brief glimpse into this record setting effort. The MPEG format video only clip is presently available in 176x112 (2.68 MB) or 352x240 (12.18 MB!!) pixel size. 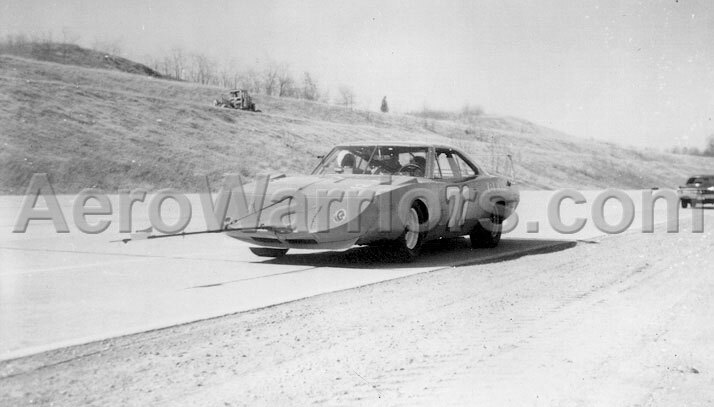 This photo was taken on the concrete test track at Chrysler's Chelsea Proving Grounds, probably sometime in the Spring or Summer of 1969. 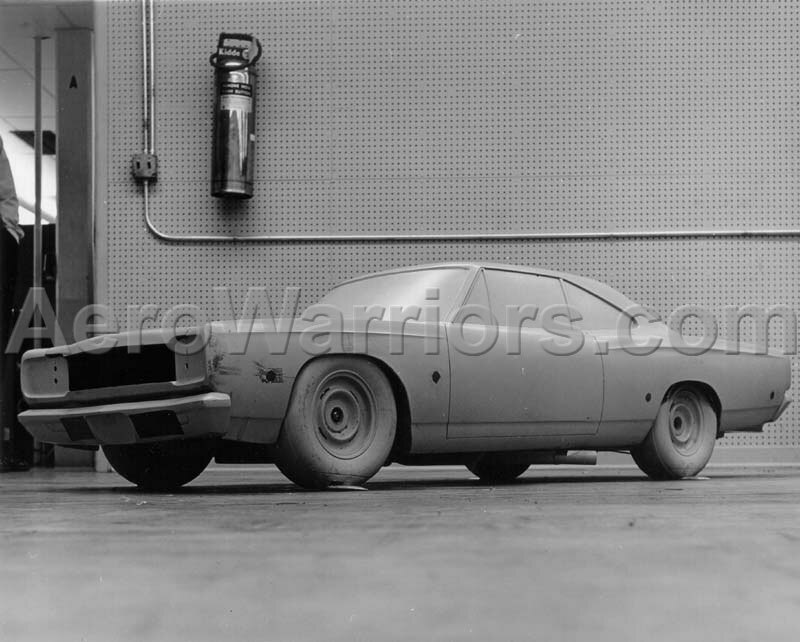 This is the #71 mule car, reportedly used in testing up to about 120 MPH. Mounted on the front of the car is a Pitotstatic tube, which allows total and static air pressure to be measured simultaneously. From these measurements, the relative wind speed and other important information can be calculated. 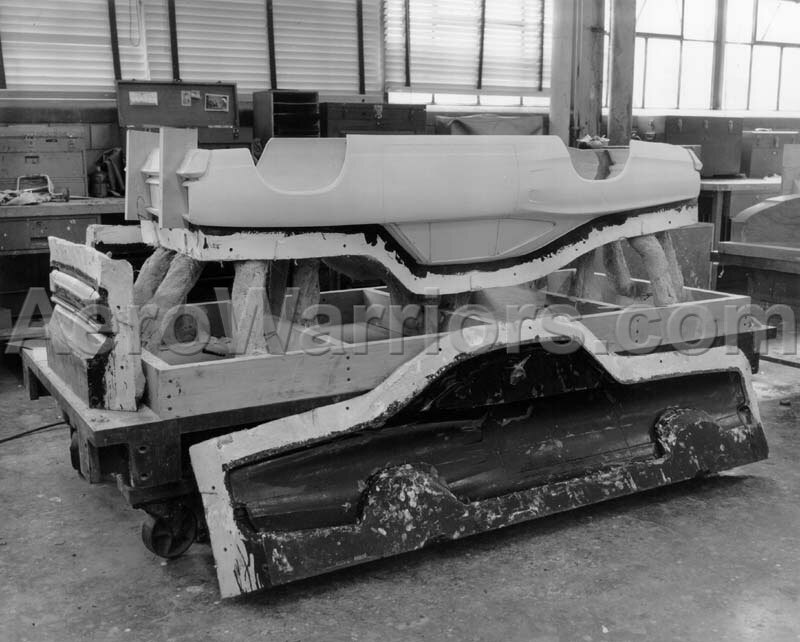 Notice the shape of the nose; it's quite different from the final design found on the race and street cars. 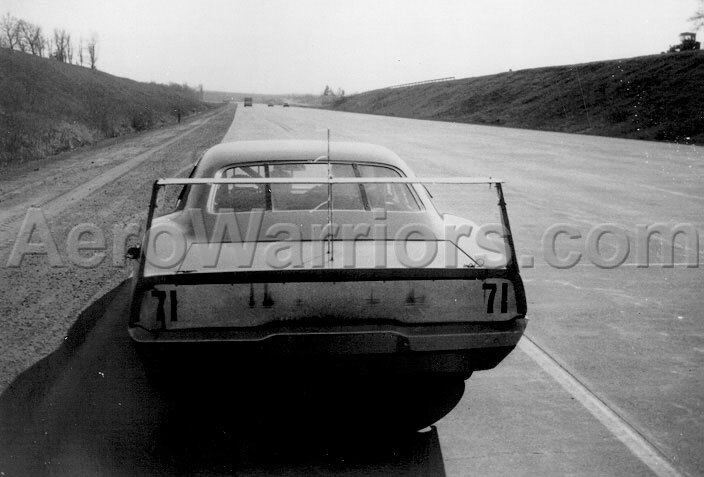 This is a view from the rear of the same #71 car seen in the previous photo. 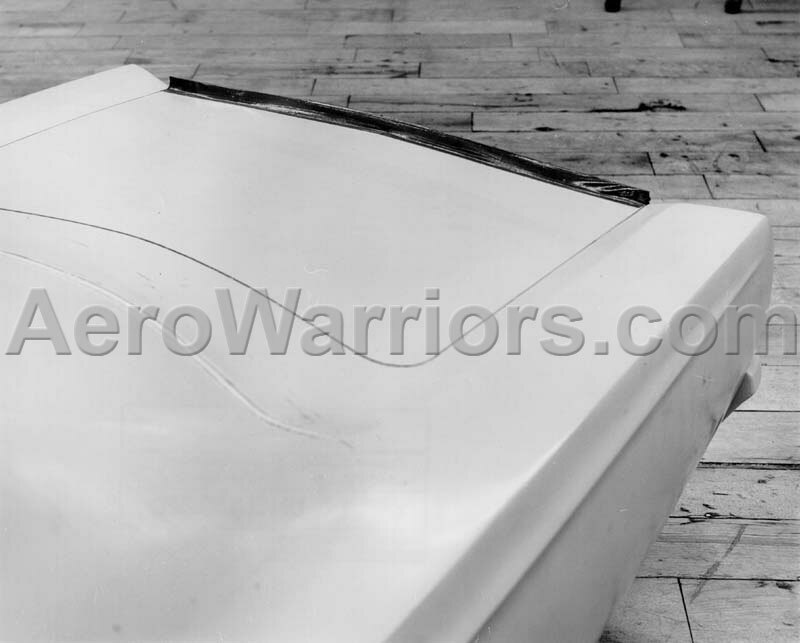 Notice the unusual wing configuration, including what appears to be a third support for the wing running from the top of the trunk lid to the wing. The purpose of the other longer rod, which extends well above the wing, is unknown. Perhaps an antenna used in conjunction with the data gathering equipment in the trunk? 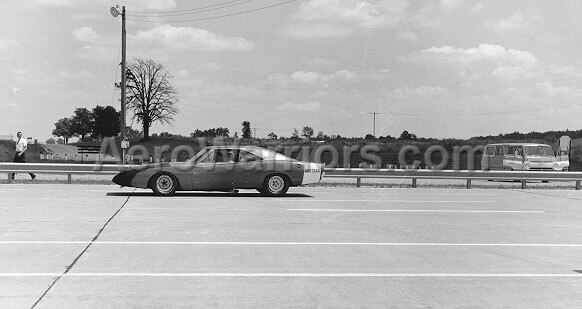 Here we see a Charger 500 parked on the front straightaway of the oval at the Chelsea Proving Grounds. 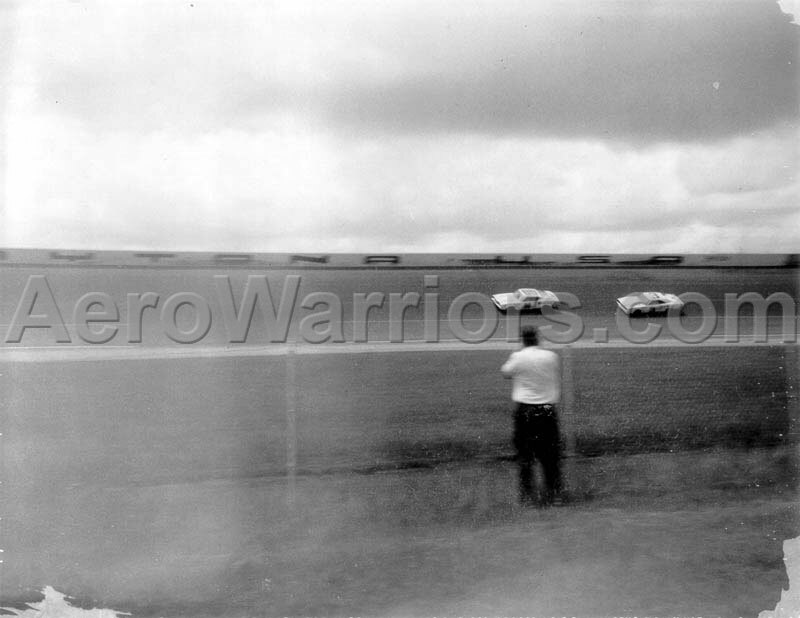 According to Greg, this photo and the eight that follow were taken in the Summer of 1969 when comparison tests were being conducted between the Charger 500 and the high speed prototype Daytona. 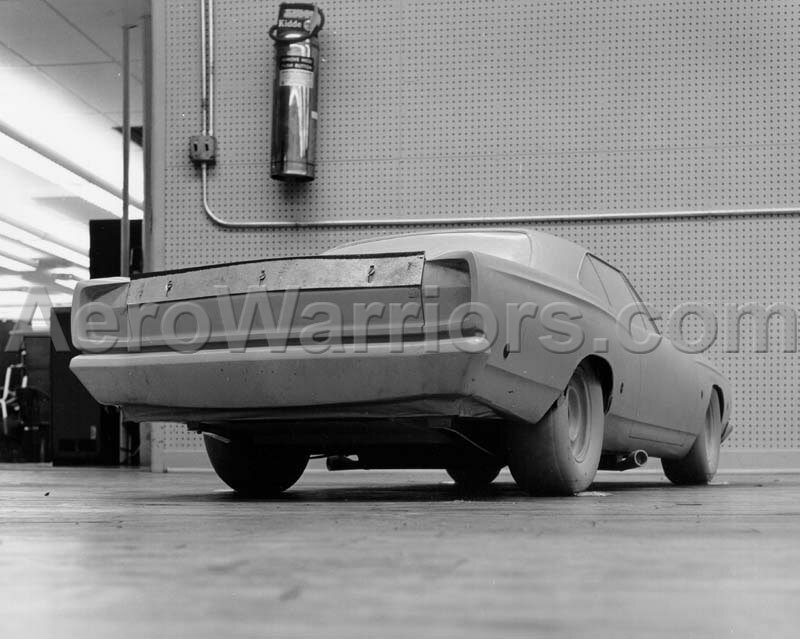 The purpose, of course, was to determine just how much better aerodynamically the Daytona was than its Charger 500 cousin (which was already on the NASCAR tracks). Also, take note of some of the automobiles that the engineers were driving - they are seen in the parking lot behind the Charger 500. This is another shot of the Charger 500 - apparently in for a pit stop. Charlie Glotzbach is the driver, and after the crew gets done working on the engine, it looks like they had better take some time to clean the windshield! 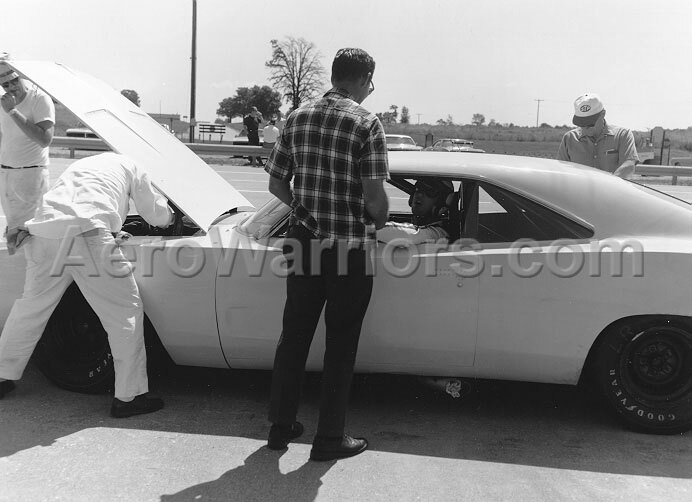 Here Charlie Glotzbach seems to be letting Larry Rathgeb (in charge of engineering in Chrysler's stock car racing program) in on just how the car is behaving. Charlie may also be reminding Larry to remove the rag from the exhaust pipe before he goes out for more laps! Greg reports that the reason for the "old rag in the exhaust pipe trick" is to prevent cool air from getting to the valves in the very hot motor. The fear was that some of the valves might be warped if this was allowed to happen. 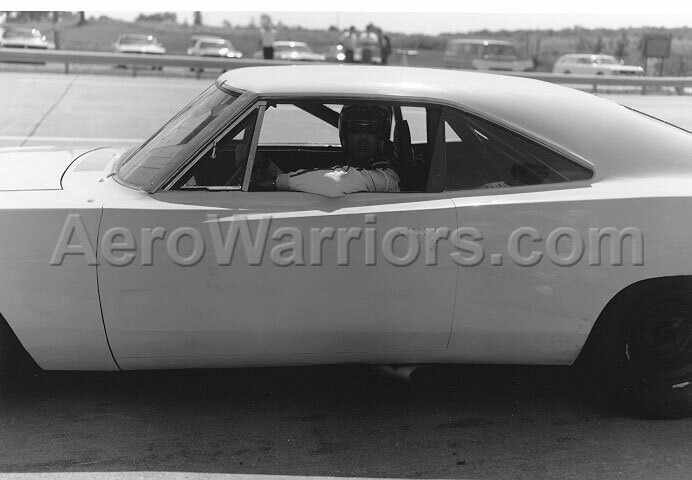 Although it's rather difficult to see in this picture, Charlie Glotzbach stops long enough to pose sternly for the camera before doing more laps in his Charger 500. Glotzbach, by the way, is still involved in racing, and recently did some "shakedown" work on a car for a very high-profile Winston Cup team. Charlie Glotzbach has stepped out of his Charger 500 and now sits behind the wheel of the high speed Daytona, several months before it first wore the famous #88. The car's color at this time was B5 Blue, or very similar. Notice also that the wing is body color, not white as seen in most commonly available photos. Also notice the black nose treatment - more on this in the next photo. Here Chrysler engineers are apparently checking data gathering equipment found in the trunk. 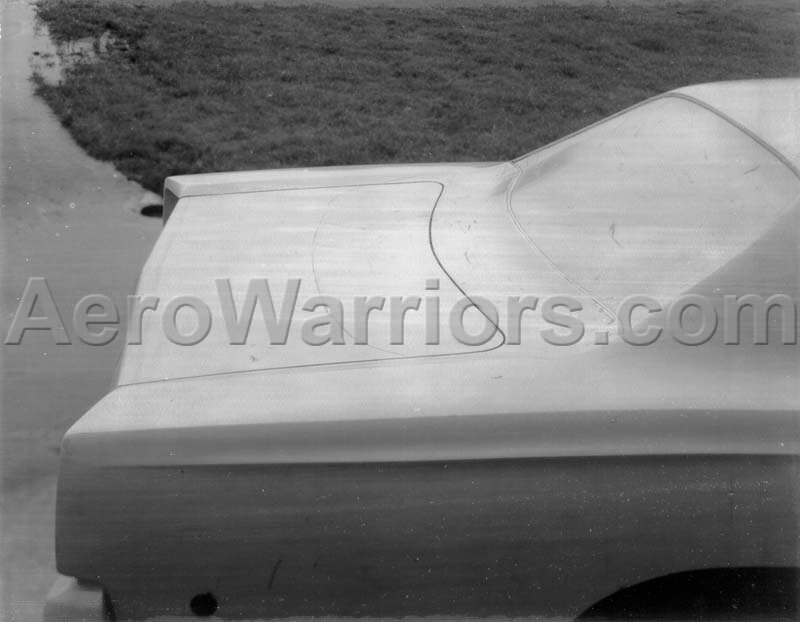 A large part of the nose on this car was painted flat black in an attempt to obscure its shape from prying eyes and cameras. You never know who might be occupying a distant hill or low flying aircraft. Now we get an even better look at the nose and its black-out treatment. The white tape seems to be an attempt to make the front a little more aerodynamic, as this nose looks to have had functional headlight doors. Later racing Daytonas would have these headlight buckets sealed closed, unless they were used to vent air to coolers. 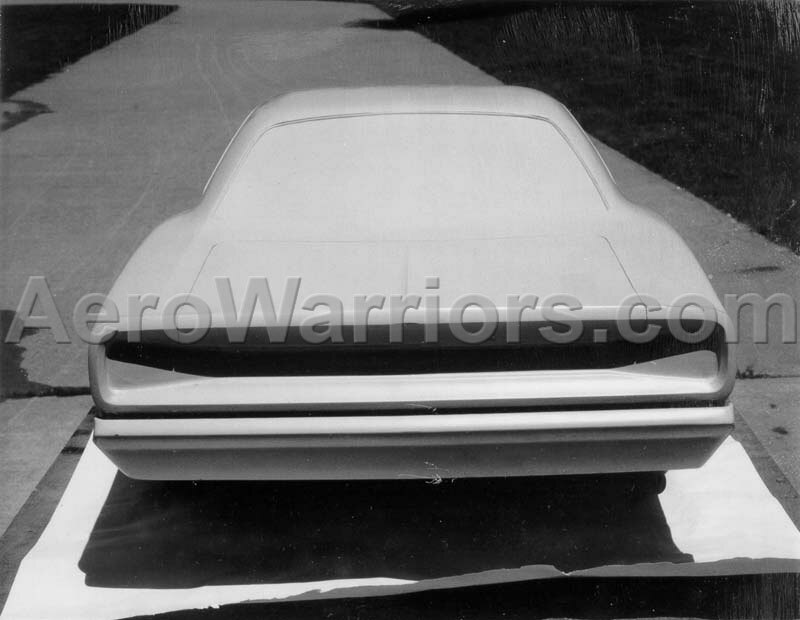 Notice also the very stock appearing air intake and spoiler. Here, Buddy Baker imagines how he might look wearing a Bowler. Also, it looks as though Charlie Glotzbach may be adjusting something in the Daytona - maybe the seat, as Charlie is somewhat shorter than Buddy. 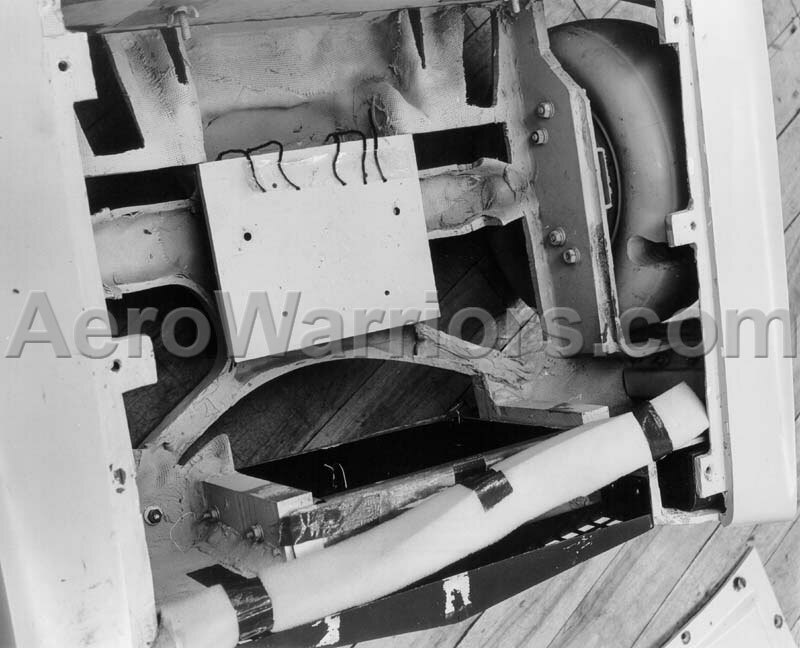 Notice the four special Dzus fasteners on the driver's side vertical stabilizer, two near the base and two in the middle. 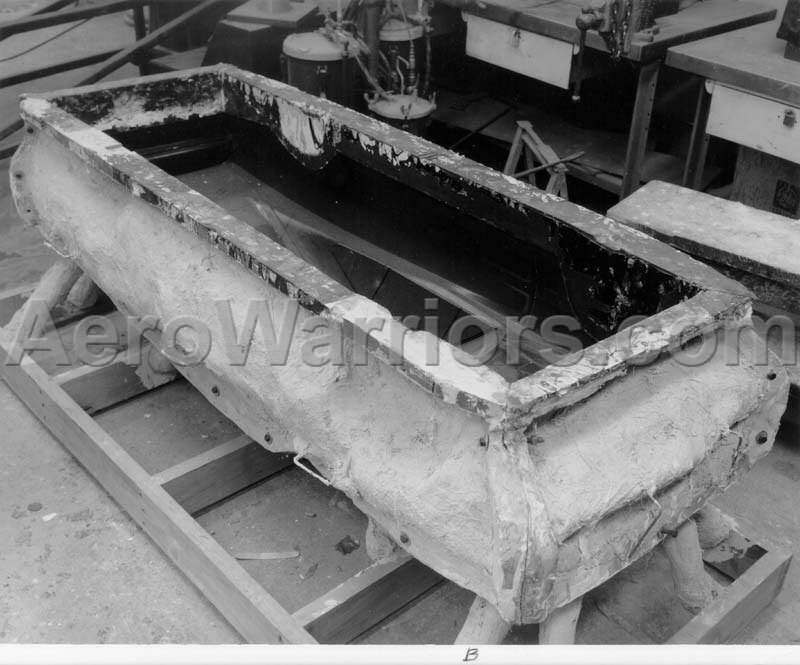 They were used to help hold the wing in place and have only been found on this car. It would seem likely that the Town & Country Wagon in the foreground was especially handy for hauling electronic equipment and tools to and from the track. If you think you have seen this photo before, you are probably wrong. 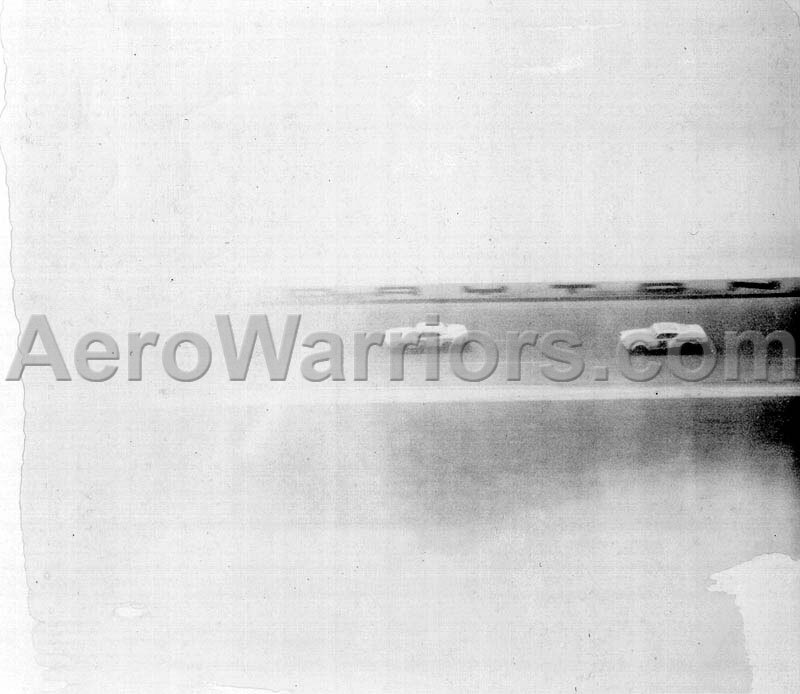 This photo was never released publicly, although it is almost identical to the one that was. Perhaps Buddy's dangling leg was the reason that this photo never saw the light of day. 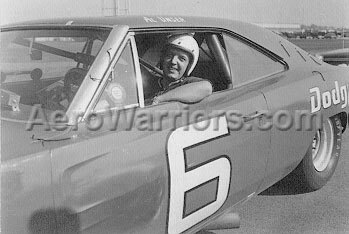 Both this and the next photo show Chrysler test driver Jerry Wenk behind the wheel of what presumably is the #6 Cotton Owens '68 Dodge Charger. 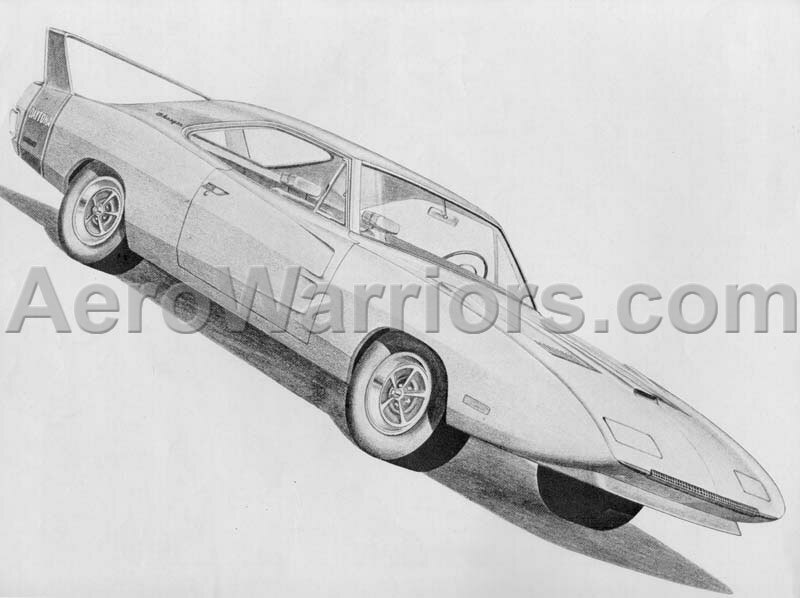 According to Frank Moriarty in his book, Supercars, the Story of the Dodge Charger Daytona and Plymouth SuperBird, this car eventually became the #71 slow speed test car (seen in the first two photos above). 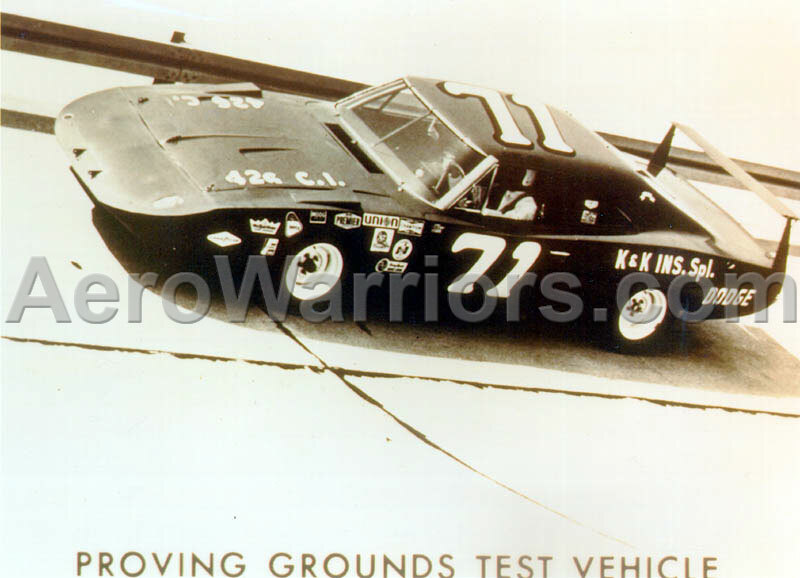 Jerry did a lot of testing in both the slow speed #71 car and the high speed Engineering Daytona prior to Glotzbach and Baker taking over the driving chores. Take note in both this and the next photo of the yarn tufts taped to the car. 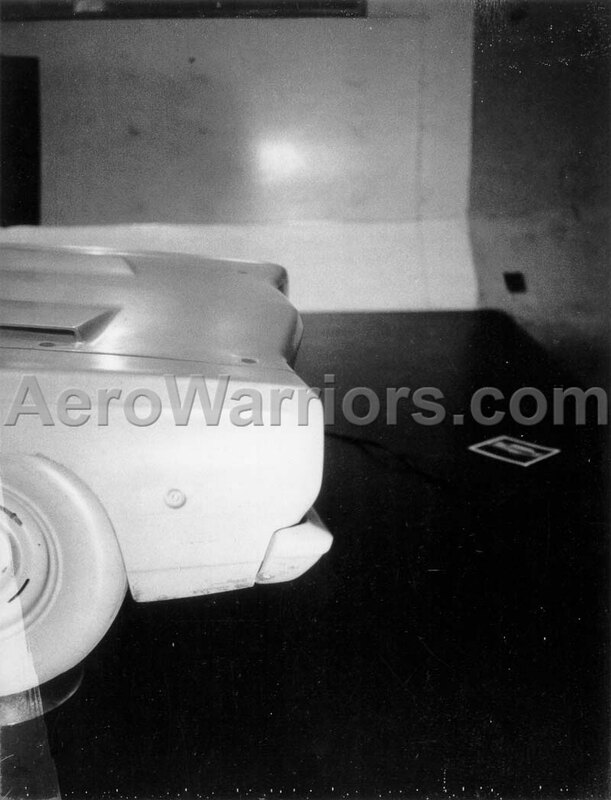 By driving the car on the test track and having a person in a chase vehicle photograph it, engineers were able to get some idea of how air was flowing around the car body. 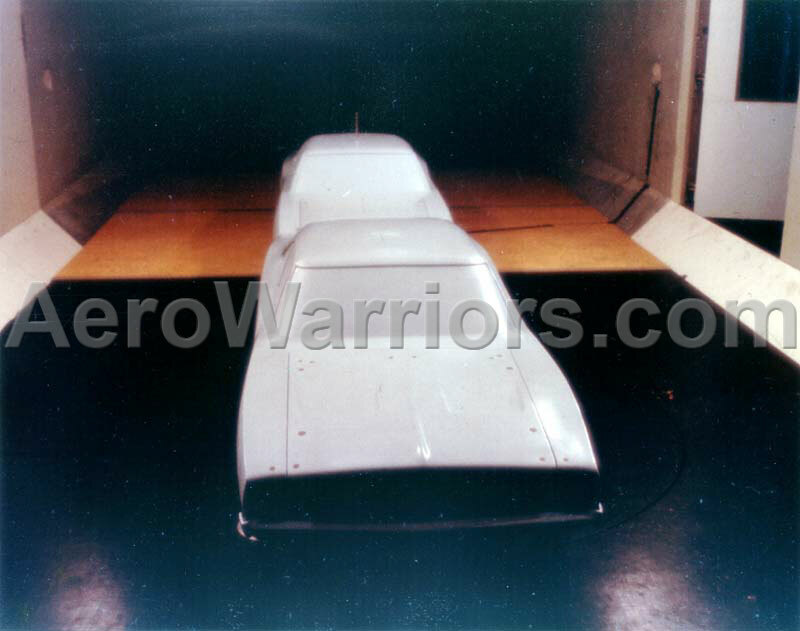 Crude, but wind tunnels were even less easy to come by in the late '60s than they are now. Greg Kwiatkowski's copy of this photo is courtesy of Jerry Wenk. 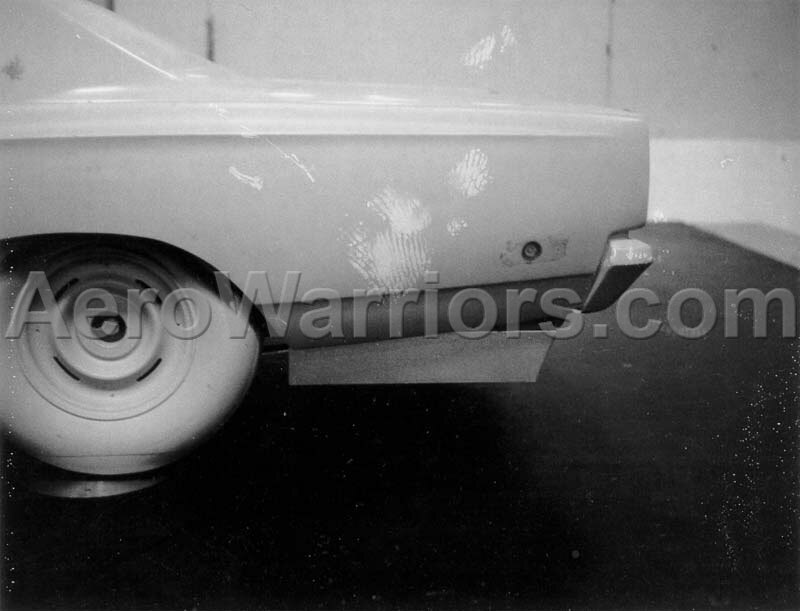 A close inspection of this picture reveals the name "Al Unser" appearing above the driver's side door area. It seems reasonable to assume that the car pictured here is the one driven by Al Unser to a fourth place finish in the 1968 Daytona 500 on February 25, 1968. Why the car Unser drove in the 500 was at Chelsea is unknown, although the Supercars book reports that Chrysler altered three cars (including the #6) by lowering them two inches, front and back. 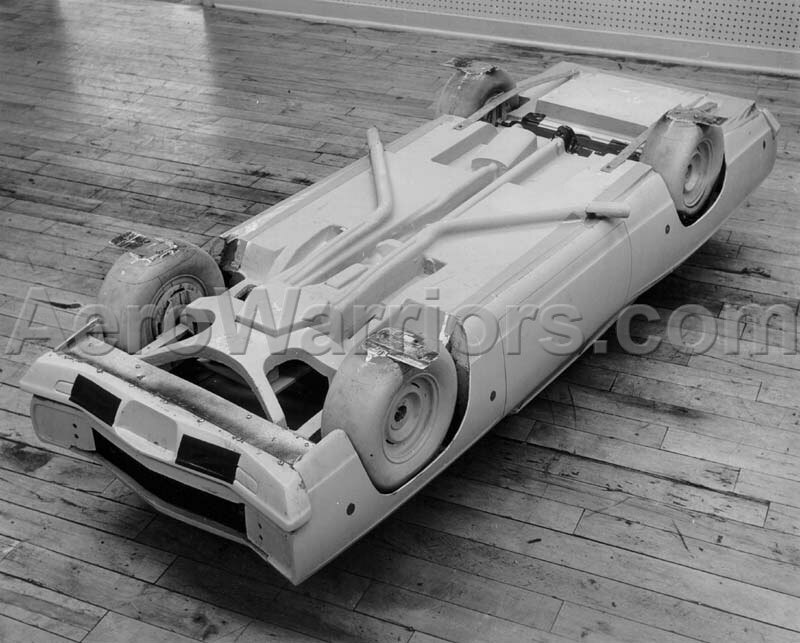 Perhaps this photo was taken at the time Chrysler was making these modifications. The book goes on to report that sometime after the Firecracker 400 in July of '68, NASCAR declared the cars illegal and the Owens #6 was then relegated to use by the Chelsea engineers. At some point after this then, the #6 became apparently became the #71 slow speed test car. Greg Kwiatkowski's copy of this photo is courtesy of Jerry Wenk. 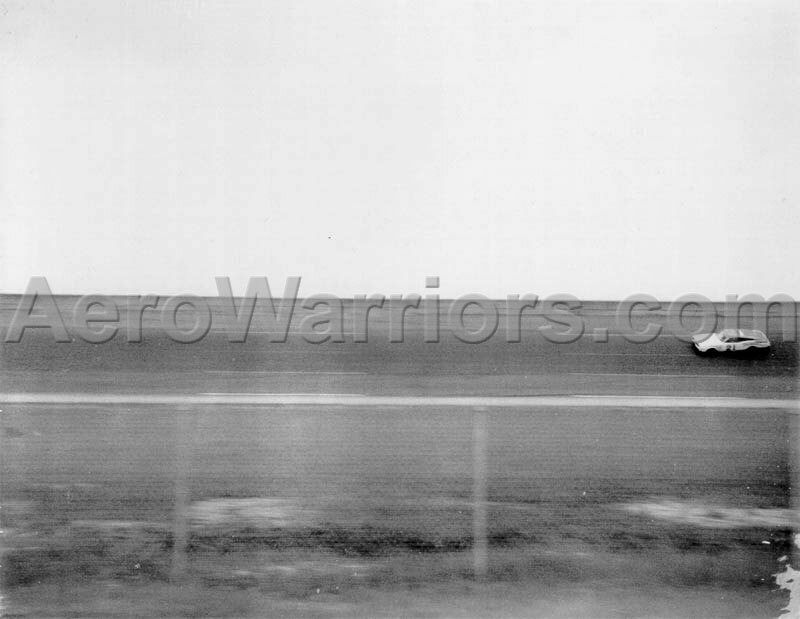 Details are a bit sketchy about this photo, but Greg believes that USAC car owner/driver Norm Nelson provided one of his '68 Road Runners to Chrysler for use as a comparison tool against cars in development. The photo was probably taken in the later half of 1968 or early 1969. 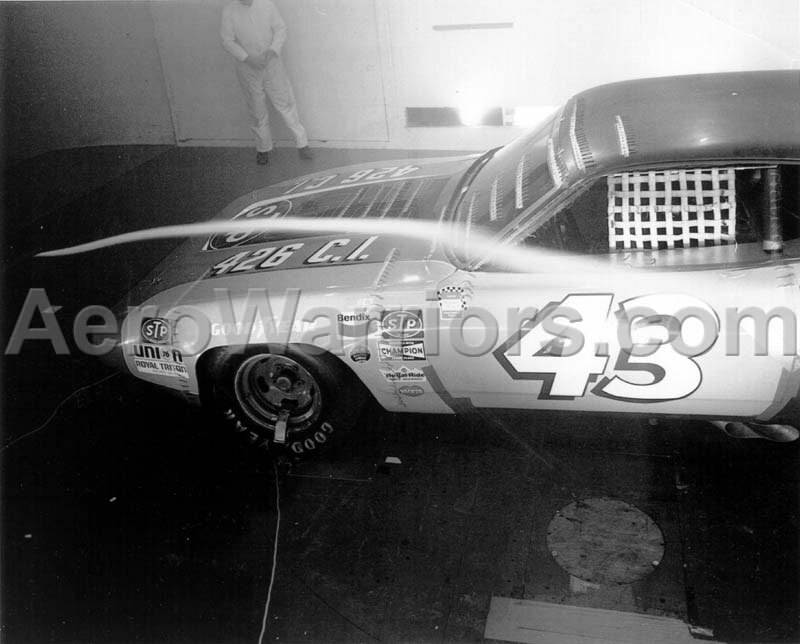 Notice the extreme rake on the car - photos from this period often show cars with this setup. They obviously benefitted from the rake (or the race teams thought they did). 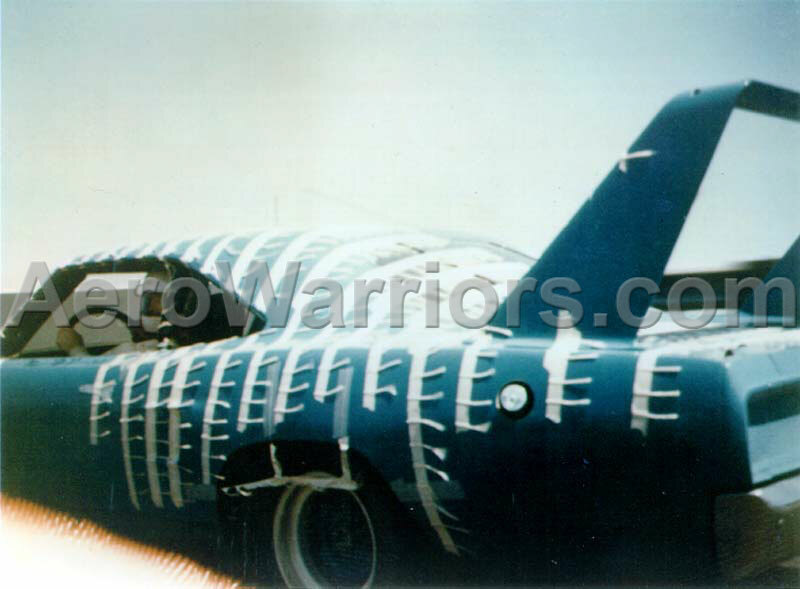 As with the #6 pictured above, the #4 is wearing tufts of yarn for aerodynamic testing. Greg Kwiatkowski's copy of this photo is courtesy of Jerry Wenk. This rather nondescript building served as Chrysler's southern race headquarters for a time. 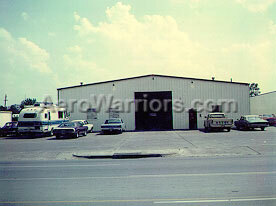 Known as Woodward Garage, it was located in Huntsville, Alabama. On occasion, some mention of this facility could be found on Chrysler's engineering cars. 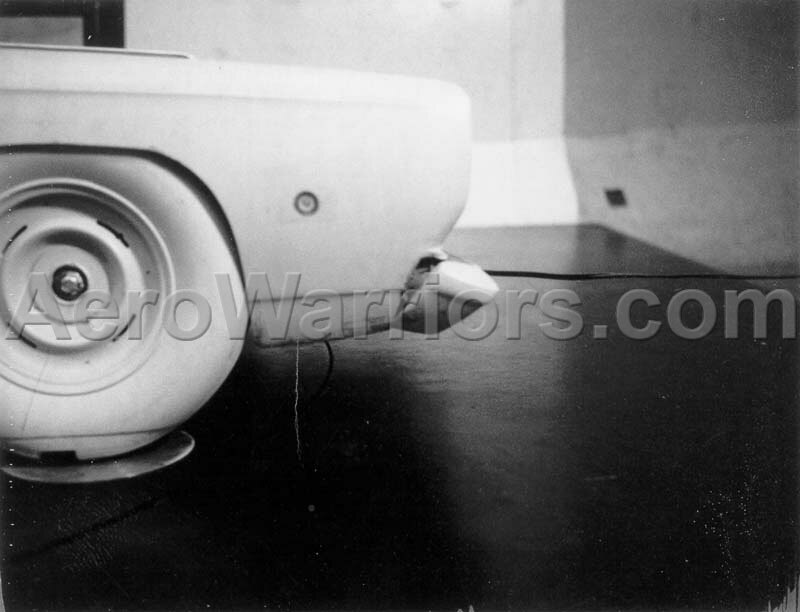 In Frank Moriarty's Supercars book, a photo taken from the rear of the Engineering SuperBird reveals "Plymouth By Woodward" written on the lower portion of the taillight panel. This exterior shot of the garage was probably taken late in the Summer of 1969. Greg Kwiatkowski's copy of this photo is courtesy of Fred and Scott Schrandt. 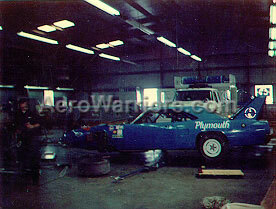 This is inside Woodward Garage, again probably late in the Summer of 1969. 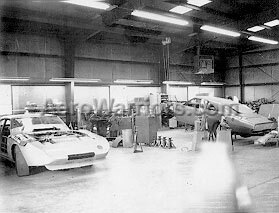 On the left is what appears to be the Engineering Daytona, apparently undergoing some major sheet metal work, possibly in preparation for a qualifying attempt at Talladega. 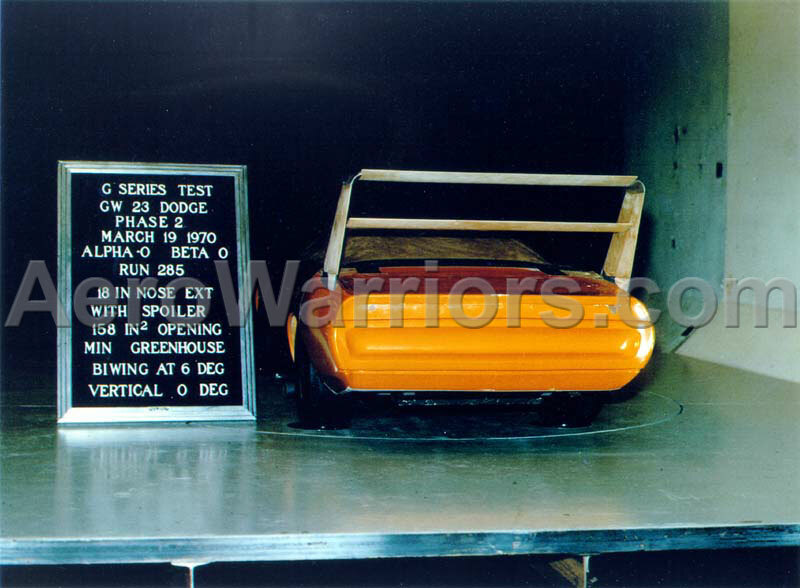 In the original photo, the word "Dodge" is just barely visible on the nose-to-radiator valence piece. This is not unexpected, as "Dodge" is the most prominent word in the slogan known to be found on the Engineering Daytona's valence piece - "Put a... DODGE In Your Garage". To the right is a Charger 500, missing most of its front hardware. It seems to have been due for a lot more than an oil change on the day this photo was taken! Greg Kwiatkowski's copy of this photo is courtesy of Fred and Scott Schrandt. 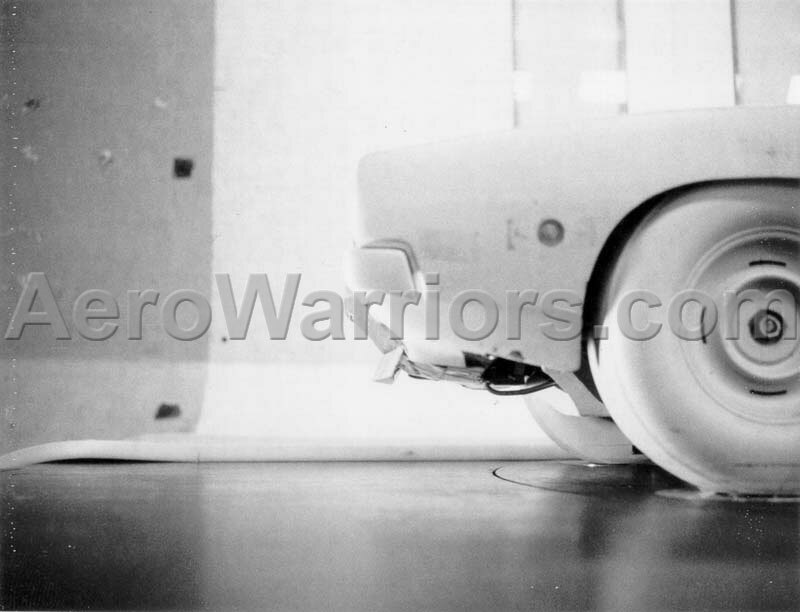 Another shot from inside Woodward, this time of the Chrysler Engineering SuperBird. 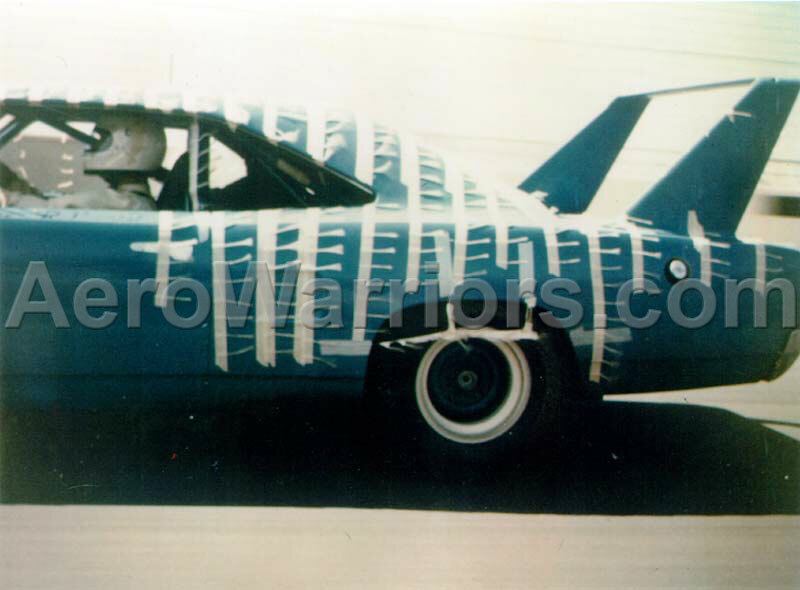 Why the car is wearing decals is unknown, as a Chrysler Engineering SuperBird was never entered in a race with this decal configuration/exterior color combination. 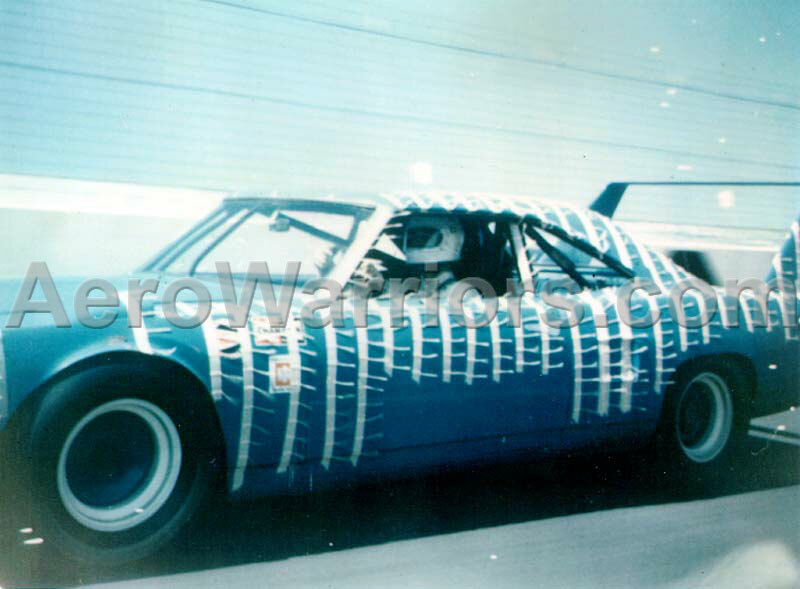 A photo in Frank Moriarty's book Supercars, the Story of the Dodge Daytona and Plymouth SuperBird, shows the Engineering SuperBird on a testing lap around Talladega. 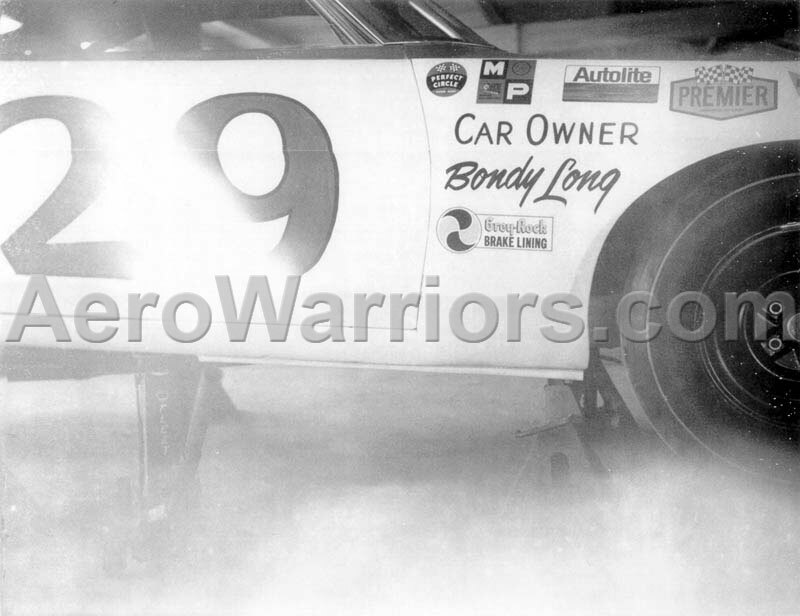 The car in the book photo appears to be sporting only three decals on the front driver's side fender - Champion, Ingersoll-Rand and Holley. These decals appear to be in the same exact location on the car at right, although they are now sharing the fender with several more decals. 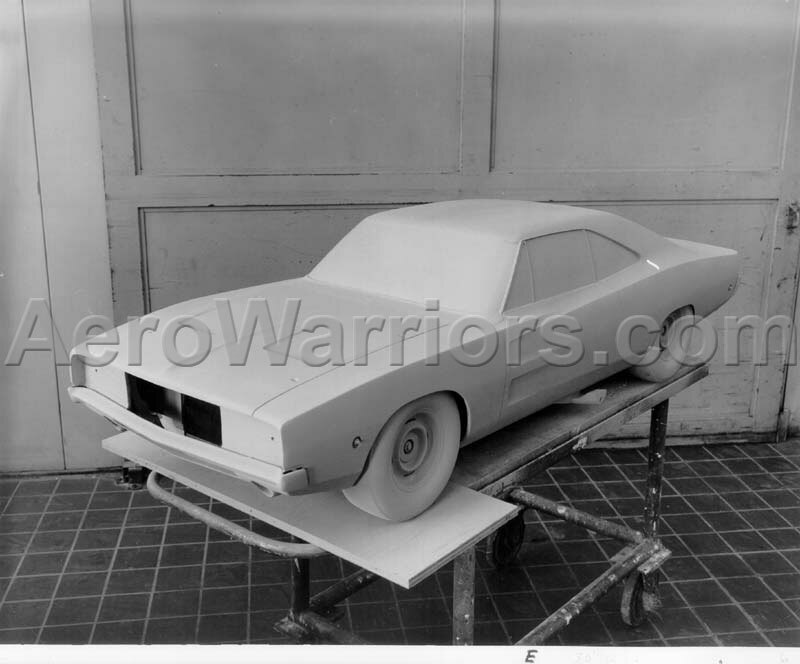 The car pictured here also declares its Plymouth allegiance above the rear wheel and sports a SuperBird decal on the wing. The car in Moriarty's book has neither. This photo probably dates to the Fall of 1969. Greg Kwiatkowski's copy of this photo is courtesy of Fred and Scott Schrandt. Yet another photo from inside Woodward. 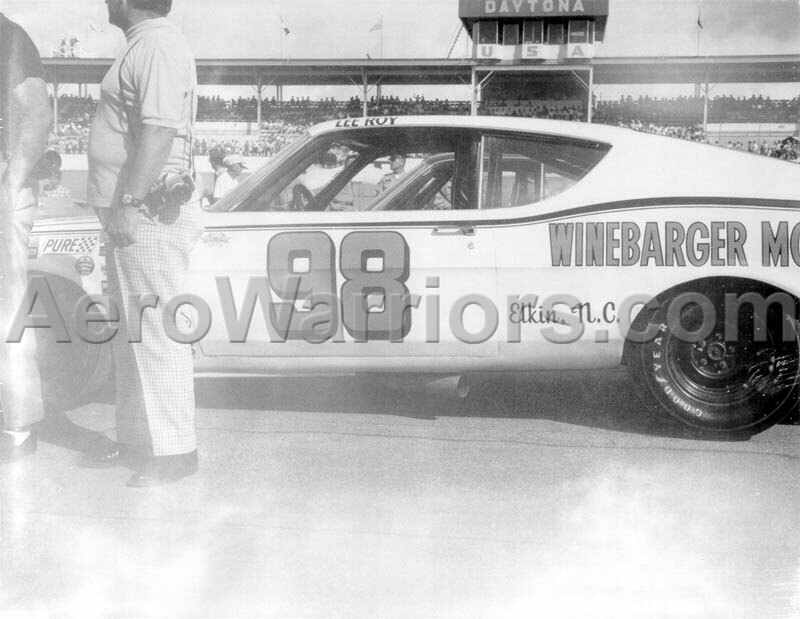 This and the picture that follows are thought to have been taken around the time the #88 was qualified on the pole for the Talladega 500 on September 10, 1969. There is only one known professional photograph of the qualifying effort, and the car in that photo appears similar to the one seen here, but there are some notable differences. More on this in the next photo. Although the car qualified on the pole for the Talladega 500, it never competed because of a driver's boycott brought about by tire safety concerns. 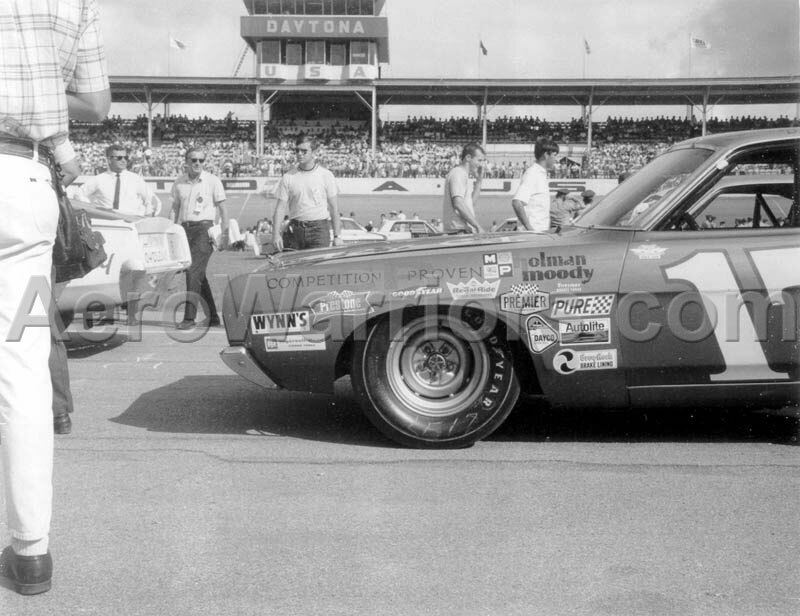 On March 24, 1970, with Buddy Baker at the wheel, the #88 Chrysler Engineering Daytona became the first stock car to officially exceed 200 MPH on a closed course. 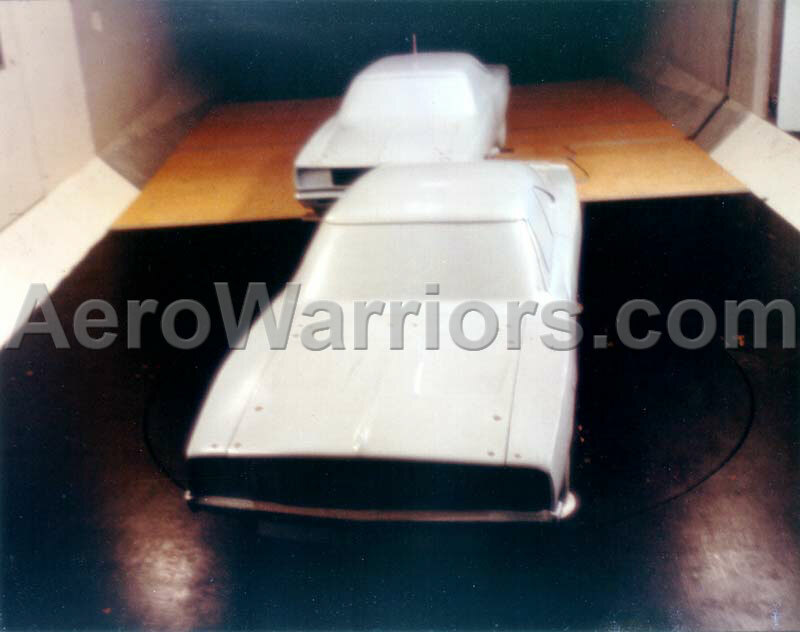 Between the time that the photo at left was taken and the March 24, 1970 200 MPH run, the car apparently had a new nose attached, was painted a lighter Corporate Blue color, and the number "88" was redone, causing it to loose its 3D appearance. Greg Kwiatkowski's copy of this photo is courtesy of Fred and Scott Schrandt. Chrysler mechanics Larry Knowlton and Fred Schrandt kneel beside the Chrysler Engineering Daytona outside the Woodward Garage in Huntsville, Alabama. 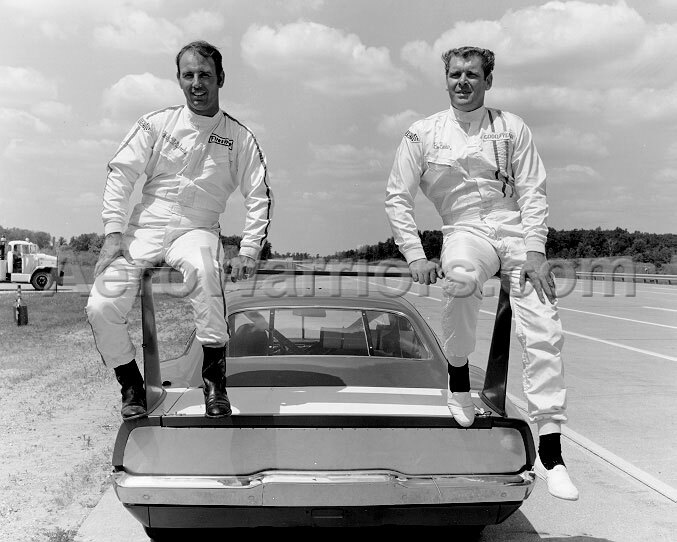 Presumably, the picture was taken around the time the car was qualified for the Talladega 500 on September 10, 1969. 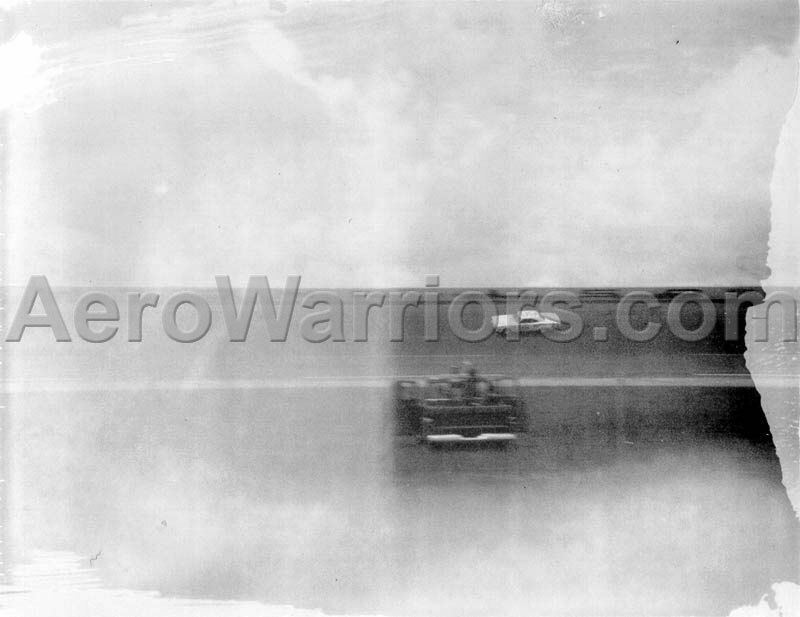 As mentioned above, there is only one known professional photograph of Glotzbach's qualifying effort. 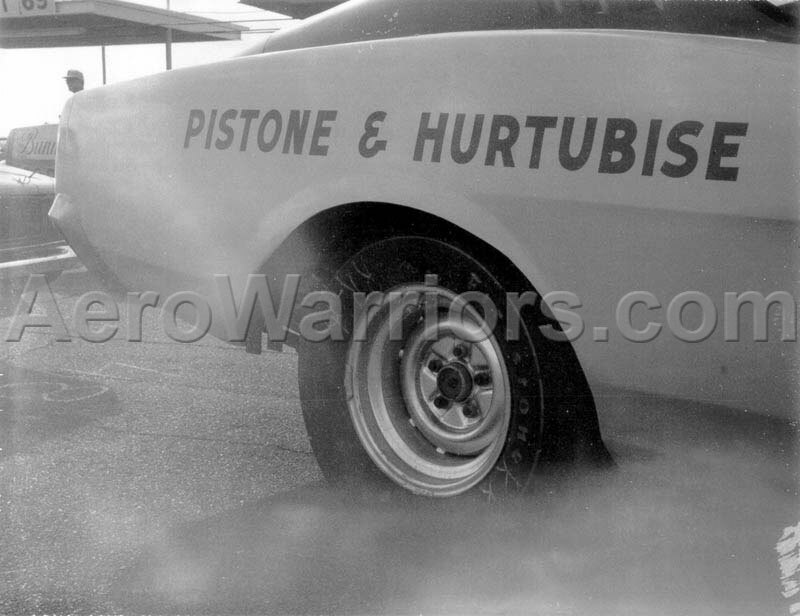 The decal configuration in the qualifying photo appears absolutely identical to that seen in the photo at right, as does the "Woodward Garage" script just below the decals to the rear of the front wheel. As far as differences, the qualifying photo reveals a car with a full set of side glass, white rims and a white "88" with no shadowing. 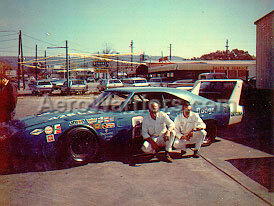 The car at right has "Charlie" written on the top of the door and what is probably a Dodge dealer's name in front of "Dodge" on the rear quarter panel - the car in the qualifying photo has neither. One guess is that the photo here was taken after Glotzbach's qualifying run on the 10th just as the car's preparation for the race on the 14th had been completed. 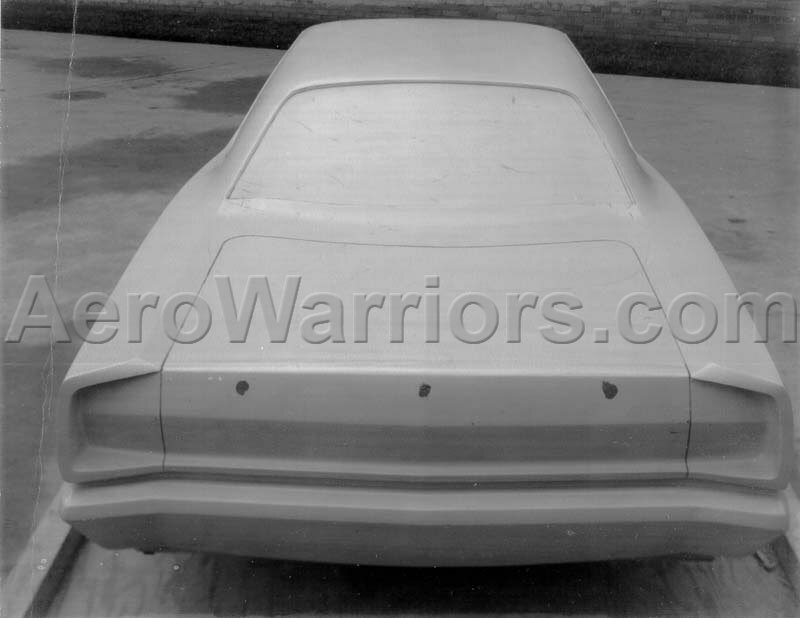 Also, barely visible in the photo are six hood pins, which are not seen on the car in later photographs. Greg reports that the front end he purchased from Don White shows no evidence of ever having six hood pins. This would seem to indicate that the car had more than one front end from the time it qualified at Talladega until the time it was turned over to Don White. 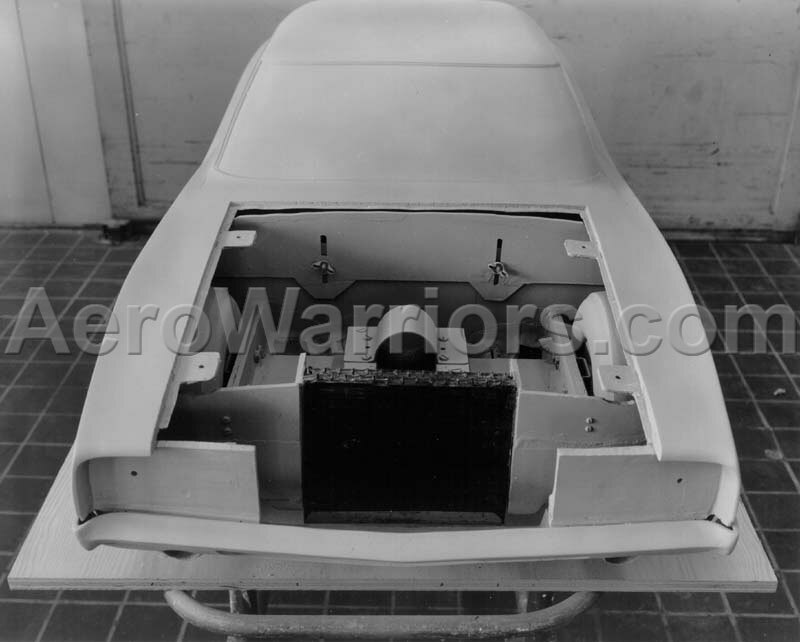 Details about the car's history and how it ended up first with USAC racer Don White and then in Greg Kwiatkowski's garage can be found in The Real #88 Chrysler Engineering Daytona! page. Greg Kwiatkowski's copy of this photo is courtesy of Fred and Scott Schrandt. Wednesday, September 10, 1969. 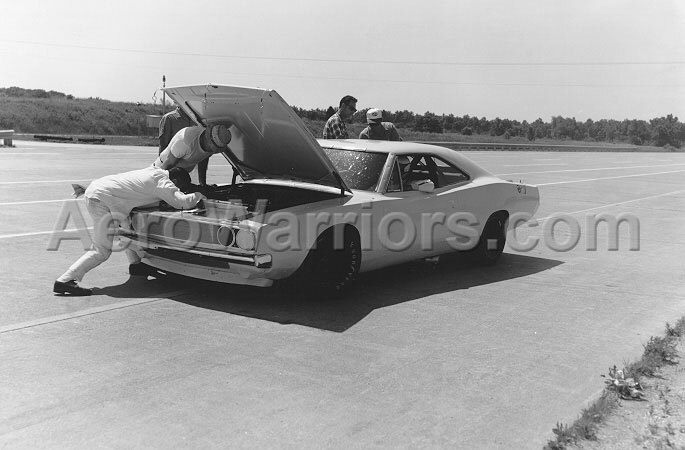 The Chrysler Engineering Dodge Daytona, with Charlie Glotzbach at the wheel, was one of just nine cars that attempted to qualify for the pole of the inaugural Talladega 500. 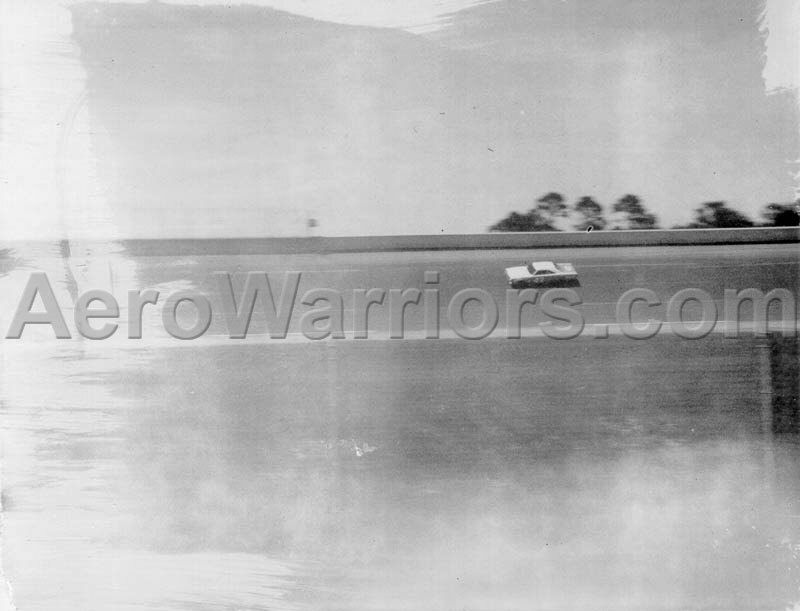 Glotzbach won the pole at an average speed of 199.466 MPH, the fastest official lap ever in a stock car, not just at the superspeedway, but anytime, anywhere. It was not politically acceptable for a factory owned engineering vehicle to be raced, so the car was officially recorded as a Ray Nichels entry. 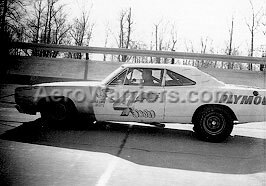 Chrysler's engineer in charge of the stock car racing program, Larry Rathgeb, wanted the car qualified because he feared that Chrysler race teams had not had enough time to work with and refine the new Daytona body style. By entering the well tested engineering car, Rathgeb could be much more certain that the Dodge Daytona's debut would include a pole, with hopefully a win to follow. Ironically, the car never competed because Glotzbach (and many other drivers) opted to boycott the race due to concerns about tire safety. 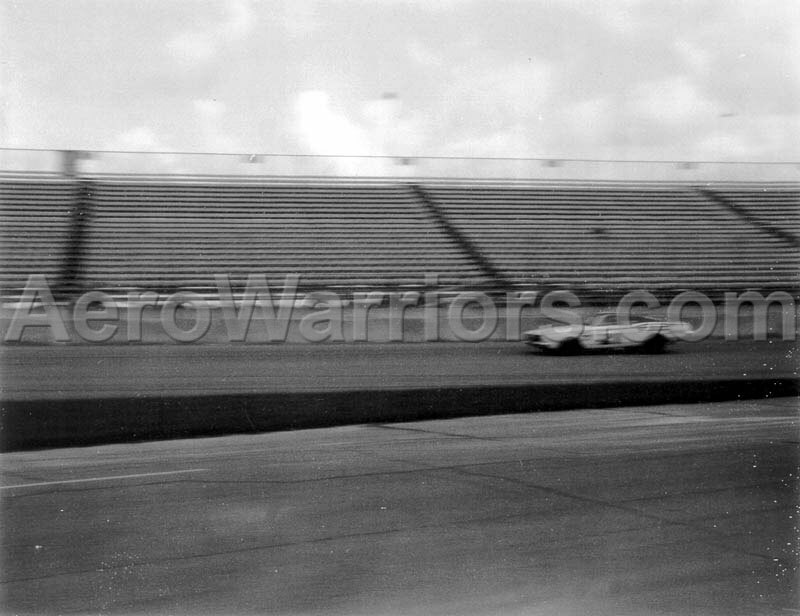 The 37 seconds of video found here are likely the only motion pictures ever made publicly available of the qualifying effort. The MPEG format video only clip is available in 176x112 (1.93 MB) or 352x240 (7.11 MB) pixel size. Greg Kwiatkowski acquired this footage through the courtesy of Doug Schellinger of the Daytona-SuperBird Auto Club. 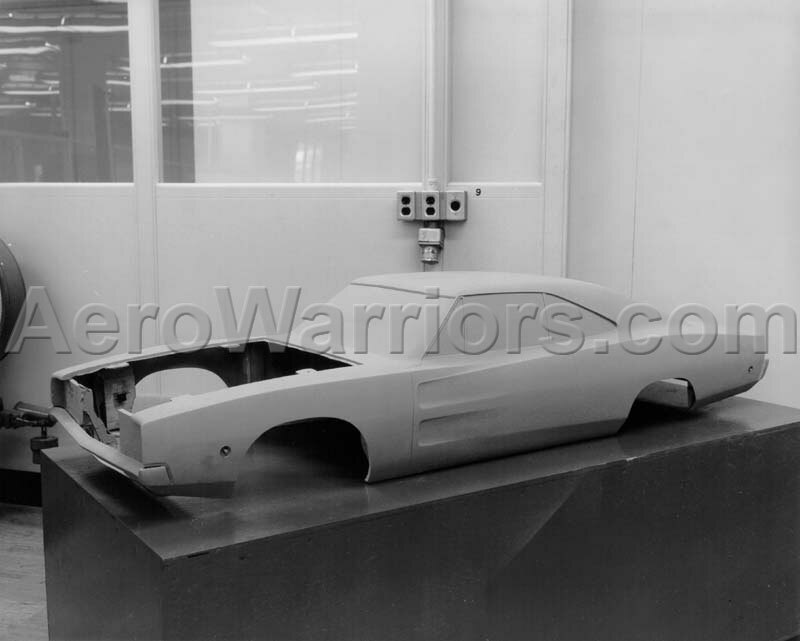 Some early images of the Dodge Charger Daytona. At left is the slow speed test vehicle on the high banks at Chrysler's Chelsea Proving Grounds. Today, it's painted as the #88 Chrysler Engineering vehicle. 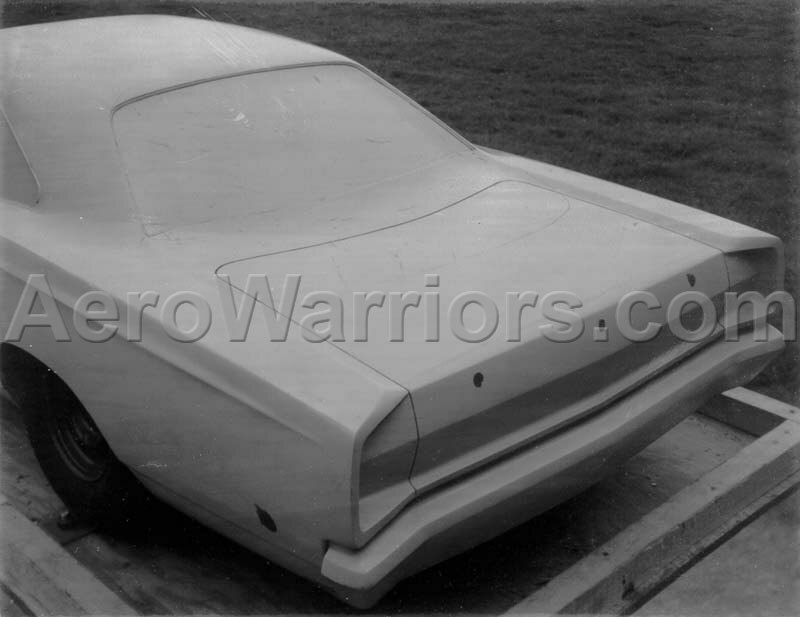 At middle is an artist's conception of an early design for the Daytona. 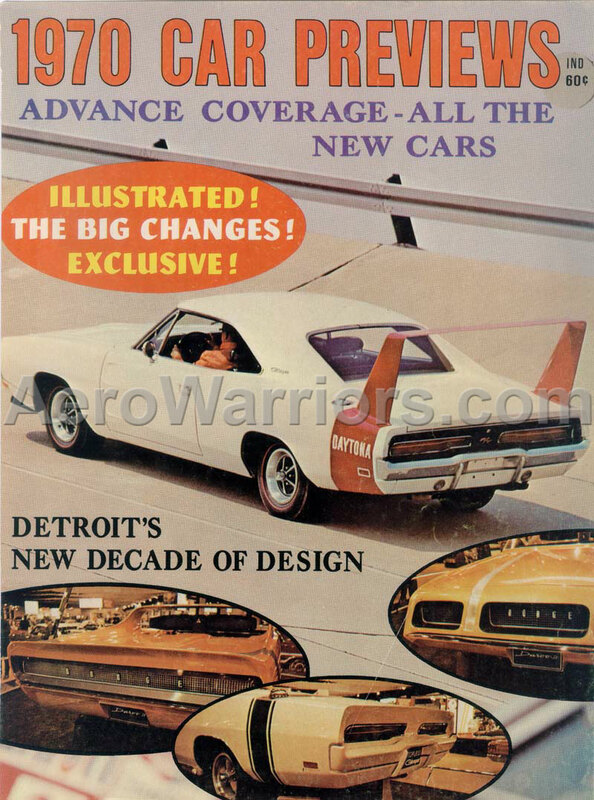 To the right is a cover from 1970 Car Previews magazine. 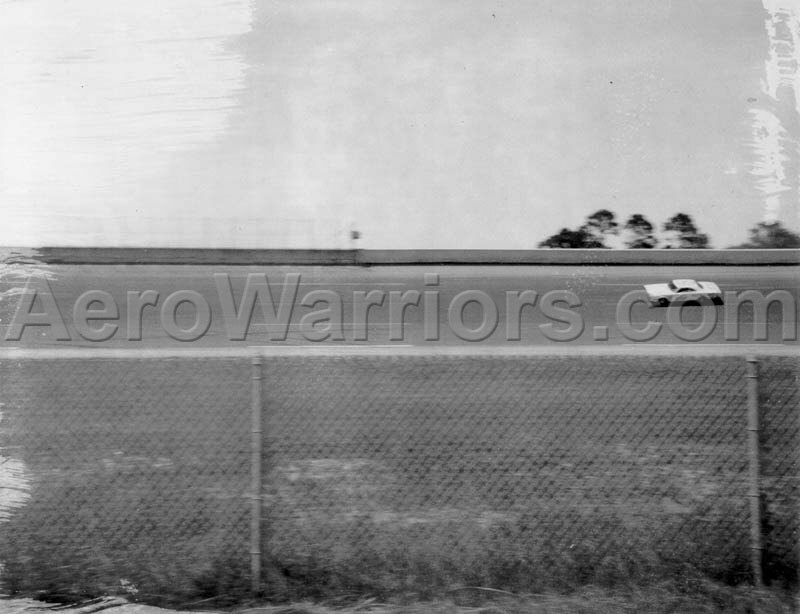 This is the Chrysler Engineering SuperBird during tuft testing, possibly at Daytona International Speedway. By watching the behavior of the strands of yarn taped to the car, air flow around it can be seen. Unusual for the times is the helmet being worn - it's a full coverage type which wasn't generally seen in NASCAR circles until many years later. 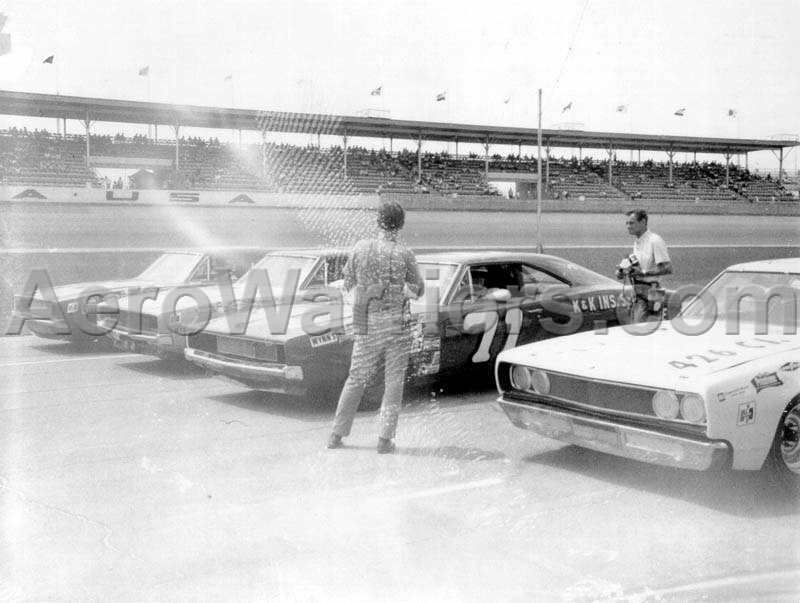 These Polaroids were taken by Chrysler personnel during the 1968 Firecracker 400 event at Daytona on or about July 4, 1968. It's probably no accident that several photos from this set are close-ups of Ford and Mercury contours. 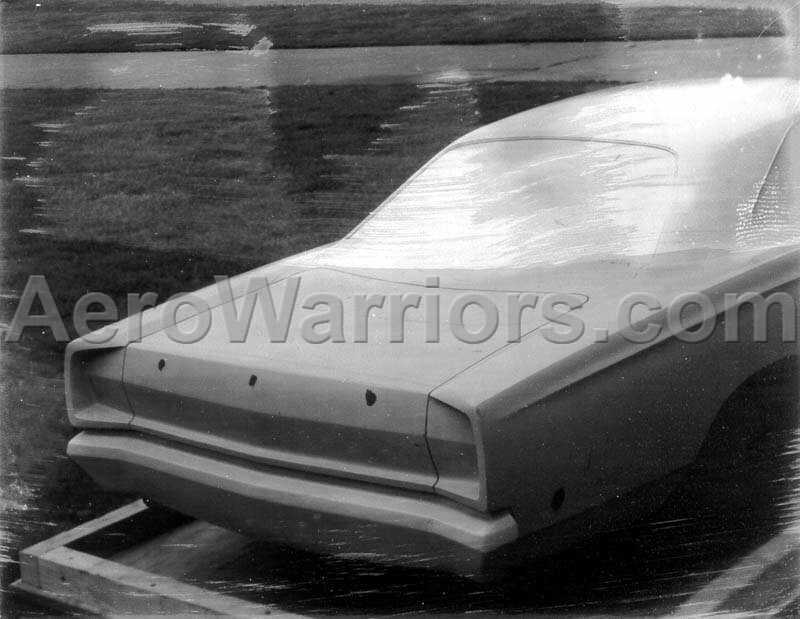 These would likely be studied later to see just what type of subtle aero improvements were being made by Ford to their supposedly "stock" bodies. At left, the Grand Marshall's Corvette and the #71 K&K Insurance '68 Dodge. 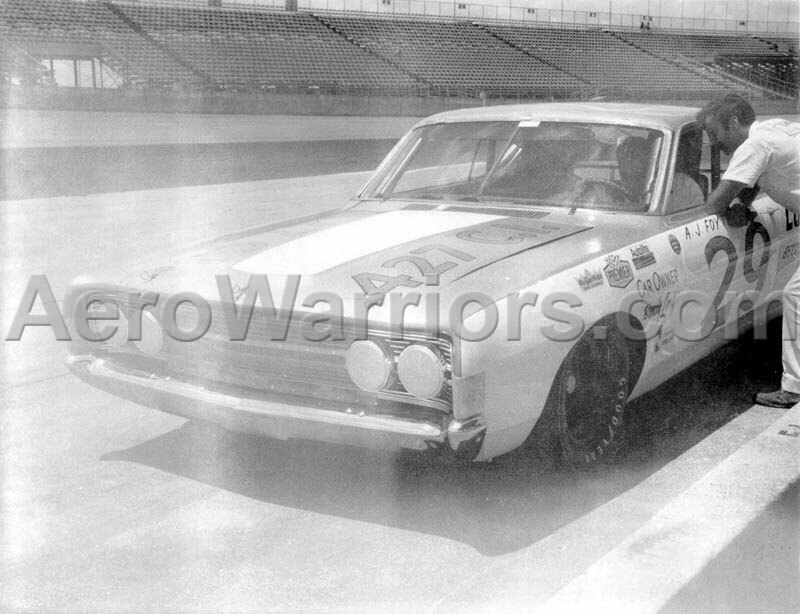 Bobby Isaac was at the wheel of the #71; he finished eighth after an eleventh place qualifying effort. 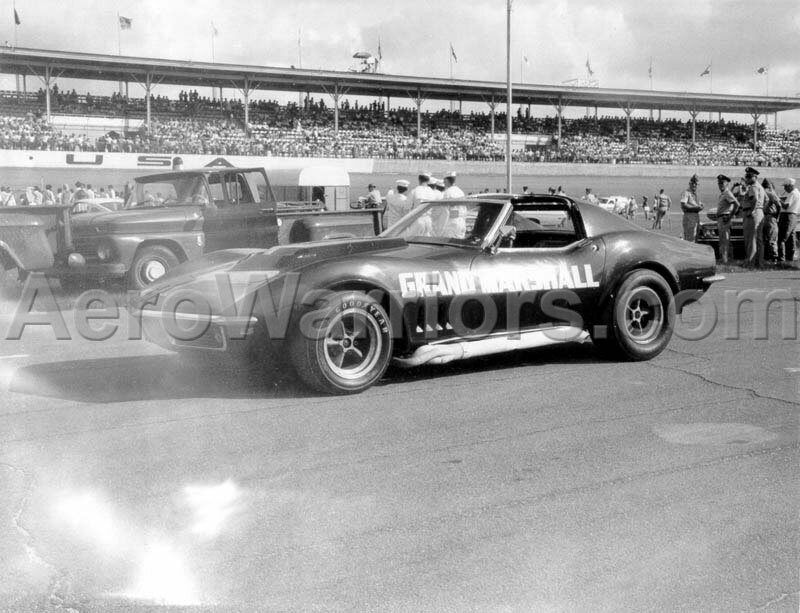 Isaac was leading the 1968 Grand National Championship standings at this time. David Pearson would go on to win it, however. Richard Petty at speed. 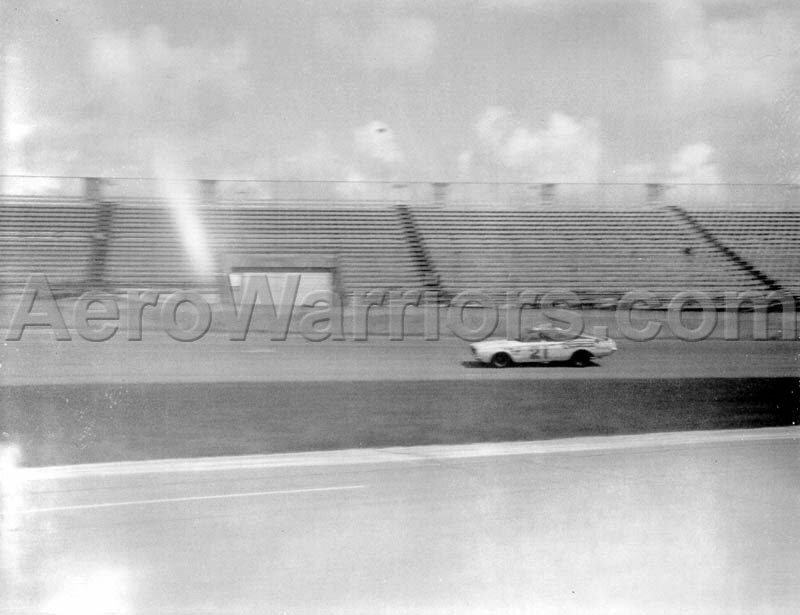 Petty started second, and eventually managed a twenty first place finish after suffering from engine problems. Petty led five laps in the early going. Paul Goldsmith qualified sixteenth and finished sixth in his Nichels Engineering '68 Dodge. He was four laps down to winner Cale Yarborough. 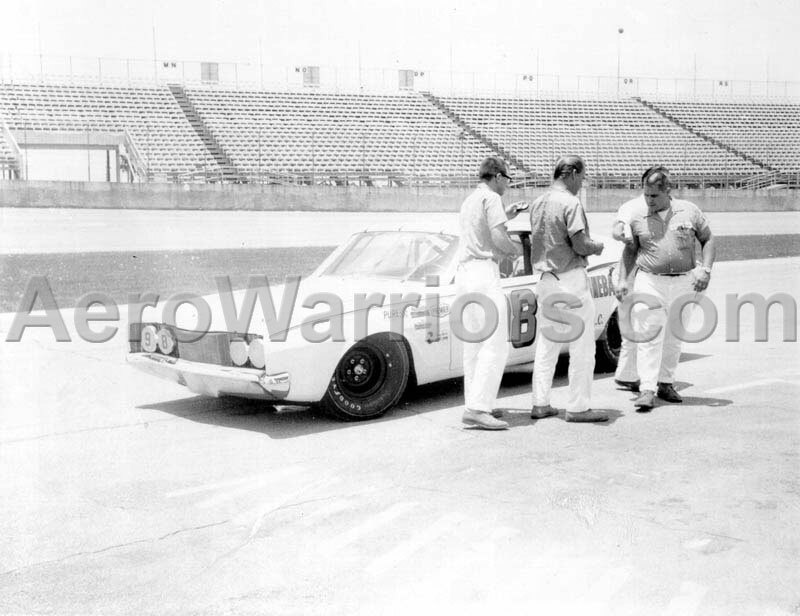 At left are Buddy Baker (#3 Ray Fox '68 Dodge) and LeeRoy Yarbrough (#98 Junior Johnson '68 Mercury). Baker made 23 laps before retiring with rear end problems; Yarbrough finished second. In the first row below is the #21 Wood Brothers '68 Mercury, driven by Cale Yarborough. 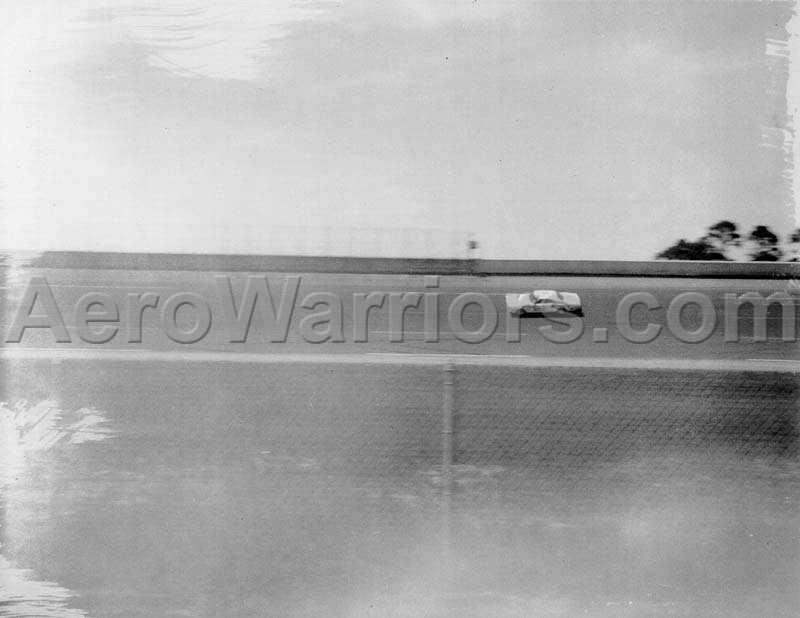 Starting fourth, Cale won the race, leading 142 of the 160 laps, setting a new event record of 167.247 MPH in the process. 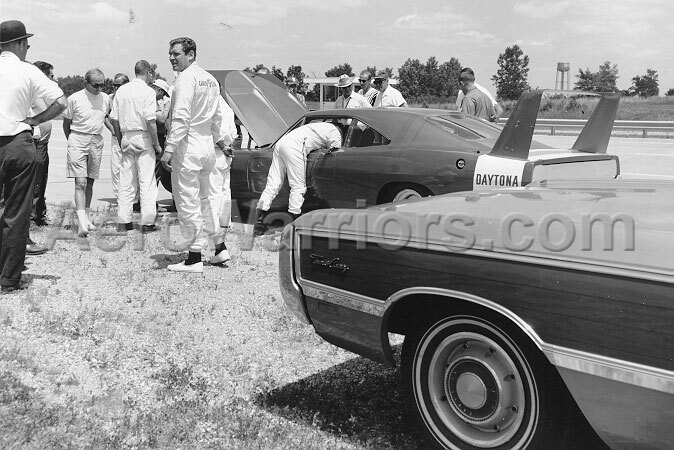 The second row below has more snapshots of the #98 Junior Johnson Mercury. 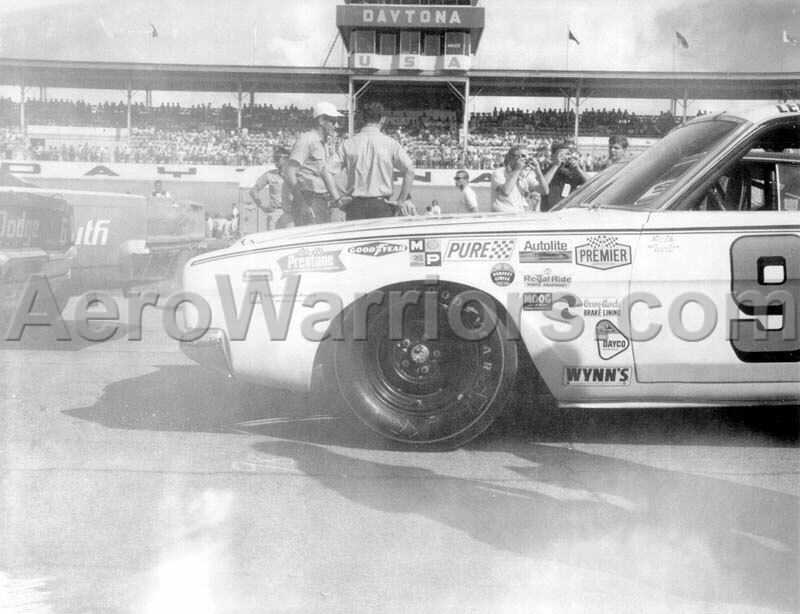 A. J. Foyt piloted the '68 Bondy Long Ford in the Firecracker 400. 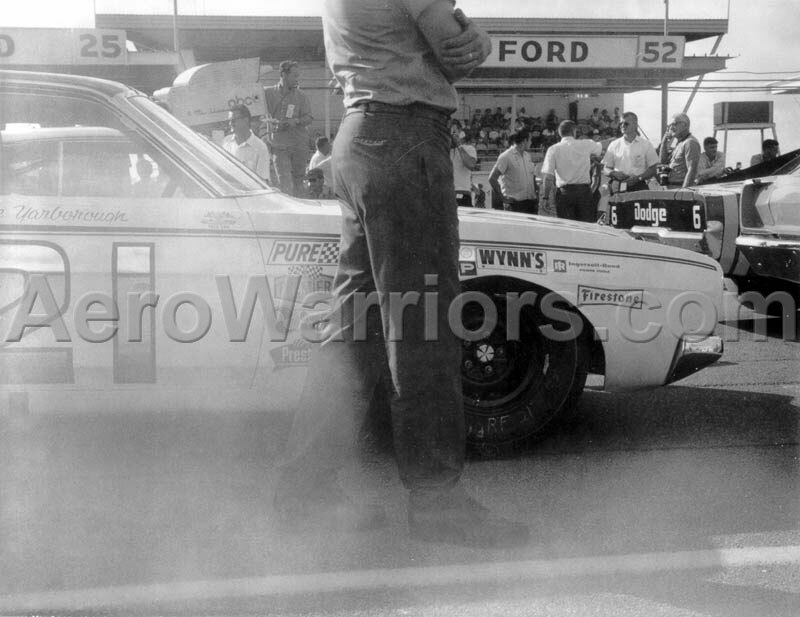 Foyt started sixth and finished thirtieth with steering problems after completing just 64 of the 160 laps. 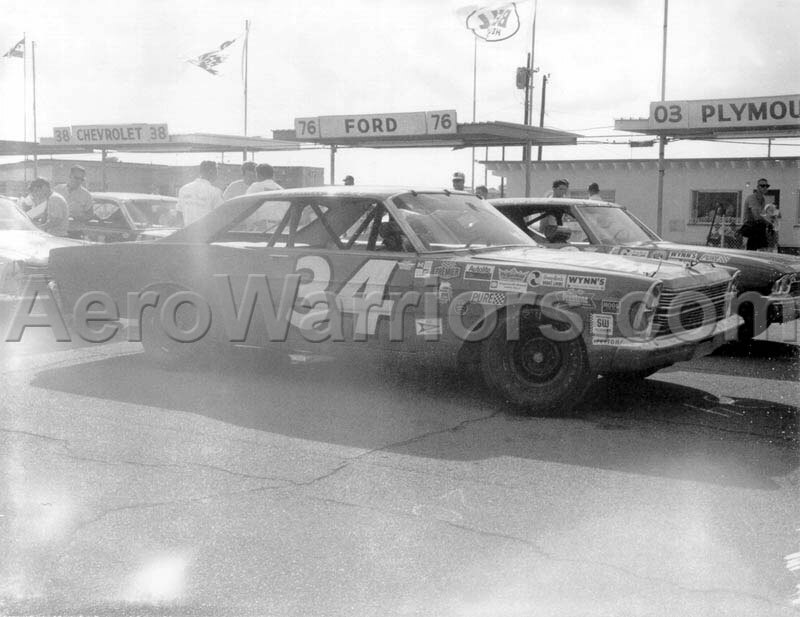 Seen here is the #17 '68 Holman-Moody Ford driven by David Pearson, Wendell Scott's #34 '67 Ford and probably the Lyle Stelter #56 Mercury driven by Jim Hurtubise. 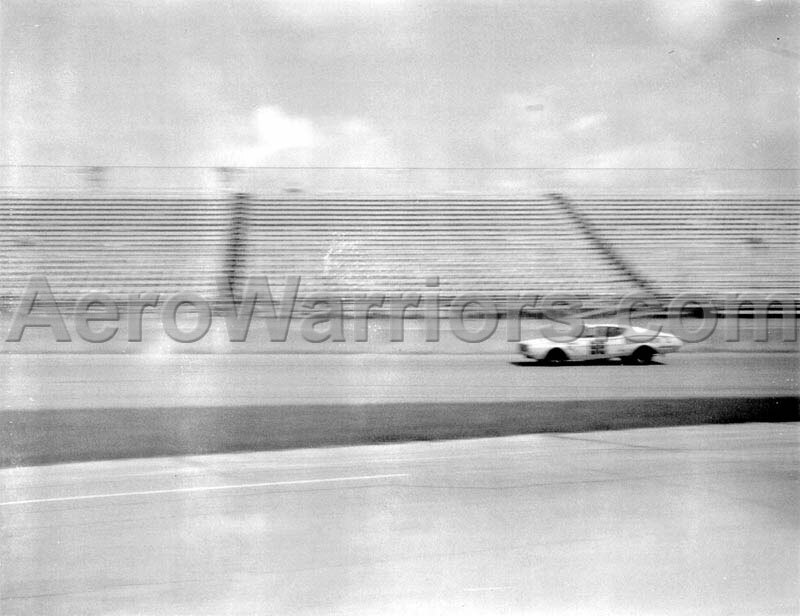 On July 5, Hurtubise drove an Indy car around the track and set a record of 191.938 MPH. 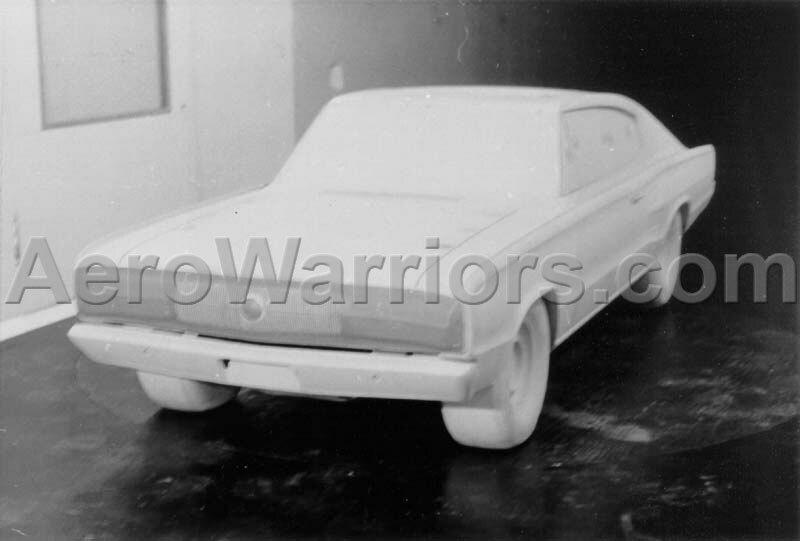 A first generation Dodge Charger scale model. 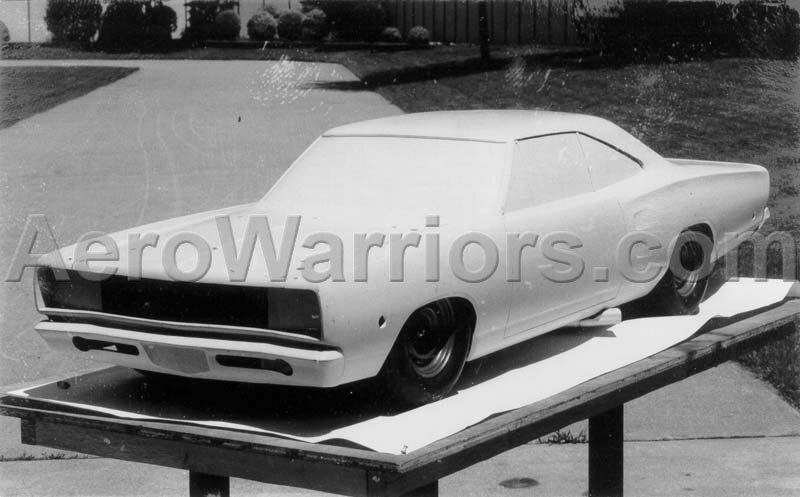 This set of photographs is of a 3/8 scale Road Runner model. All are dated November 7, 1968, and carry the identification "Photographic Laboratory, Space Division, Huntsville, Alabama". 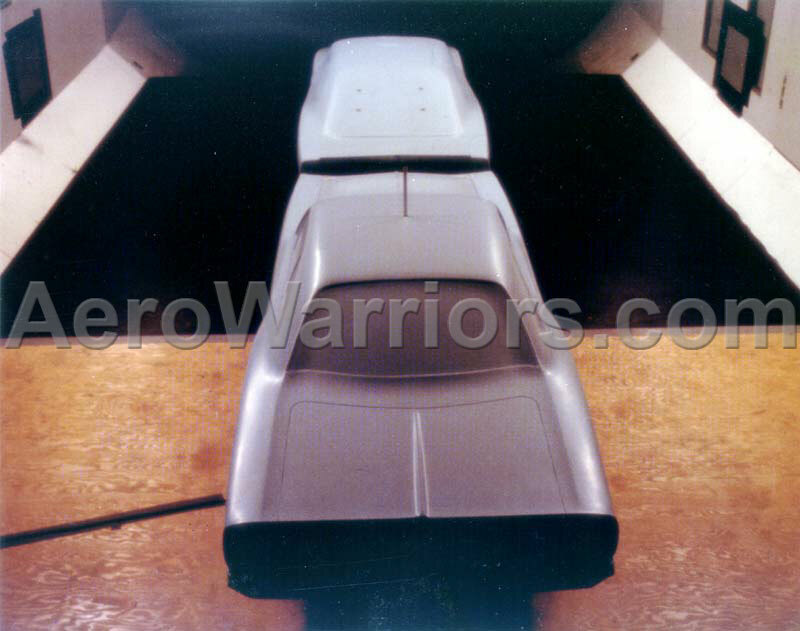 Notice the detail in the engine compartment and undercarriage, as well as the adjustable trunk lip spoiler. 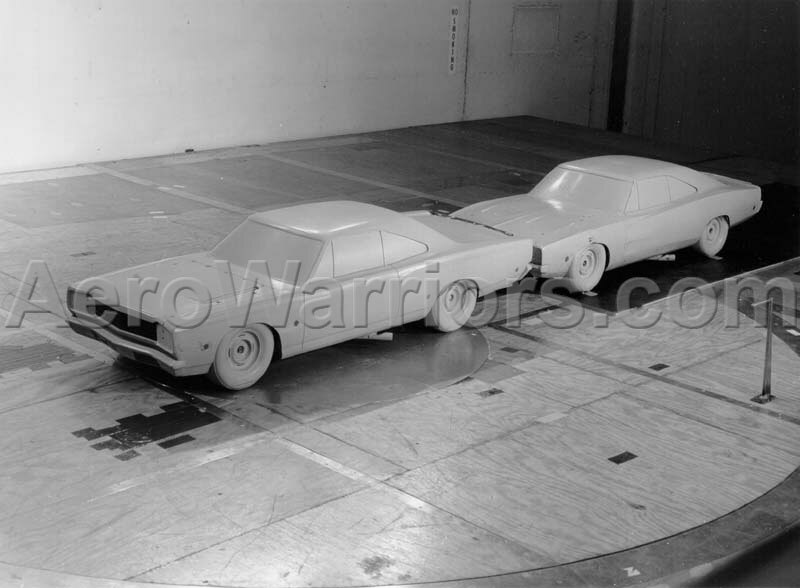 Chrysler made a number of models like this during the late '60's for use in wind tunnel testing. 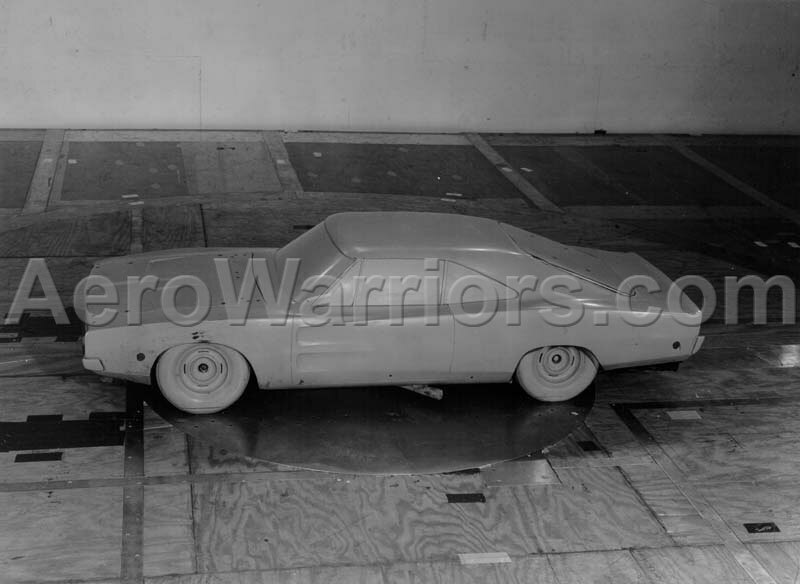 Detailed scale models apparently offered an affordable alternative to extensive testing of full-size cars in full-size wind tunnels. 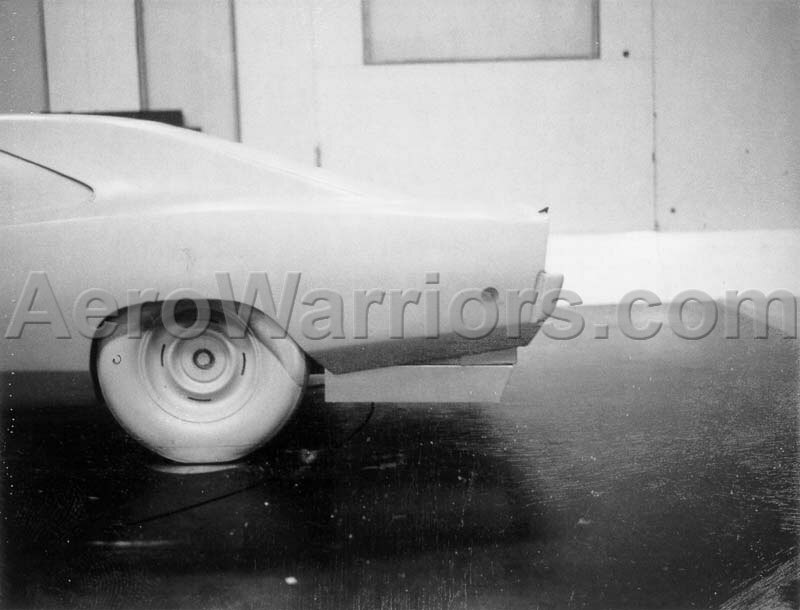 Some of the other 3/8 models used by Chrysler for aerodynamic studies are found in the photo sets that follow. More shots of the 3/8 scale Road Runner, this time outside and without the adjustable spoiler attached. 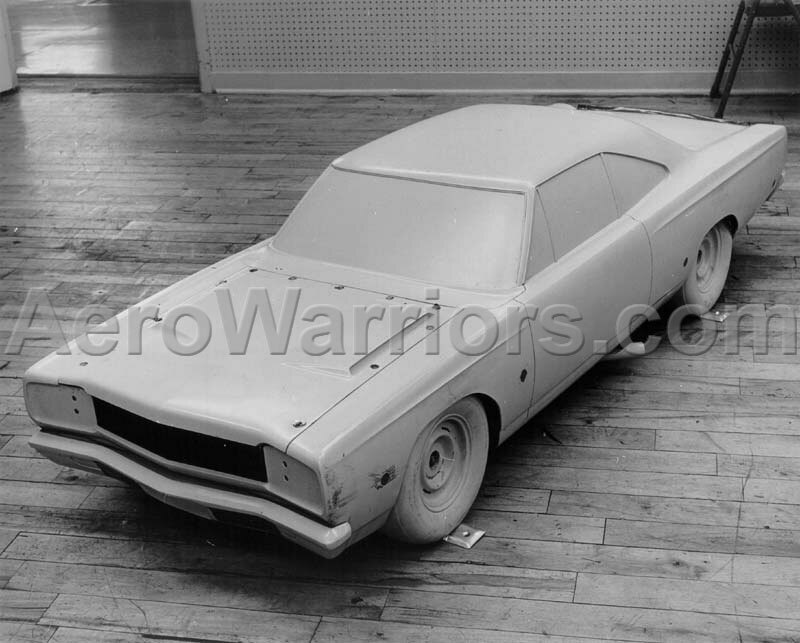 These photos document various details of the Coronet and Charger 3/8 scale models, including the mold used for making the Coronet's shell. The 3/8 scale Dodge Coronet model. 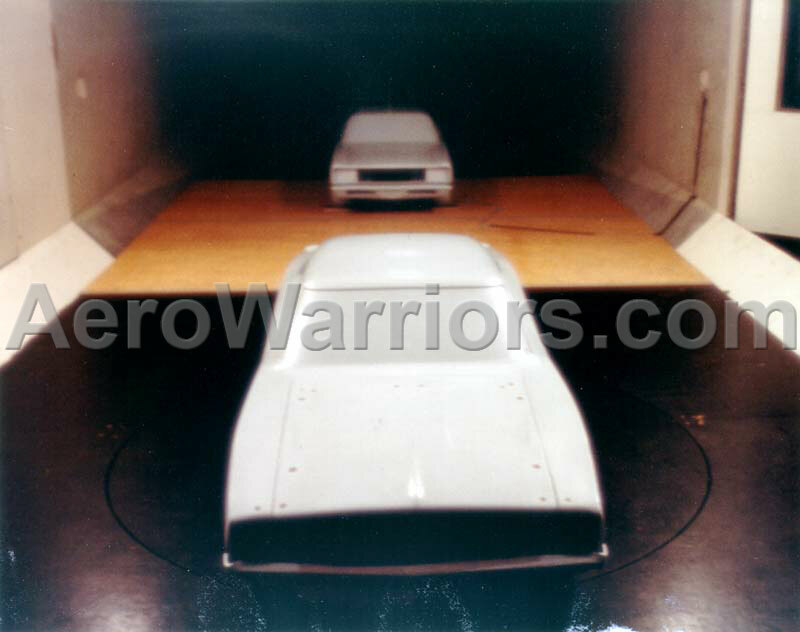 Chrysler chose 3/8 scale because of the 5' x 7' cross sectional size of the wind tunnel where they expected to do much of their testing at the Wichita State University in Kansas. 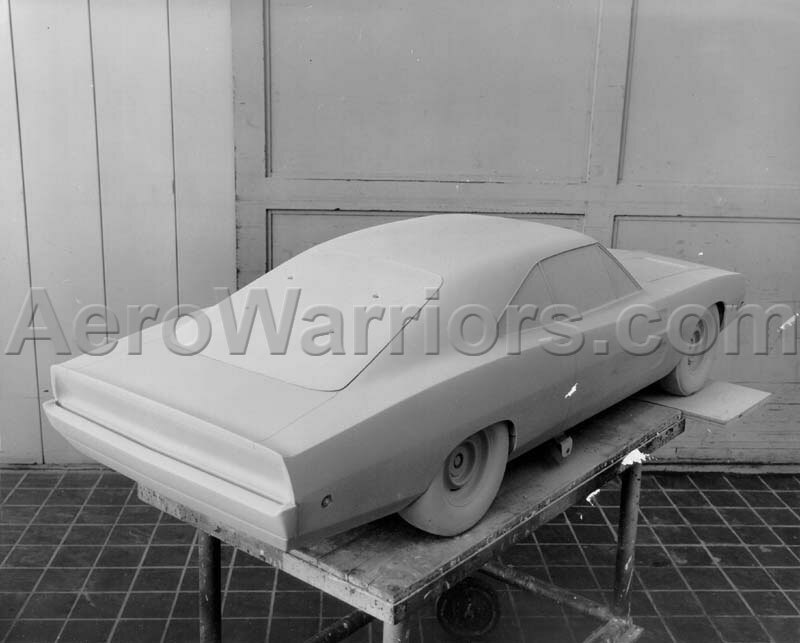 The 3/8 scale Road Runner and Charger models. 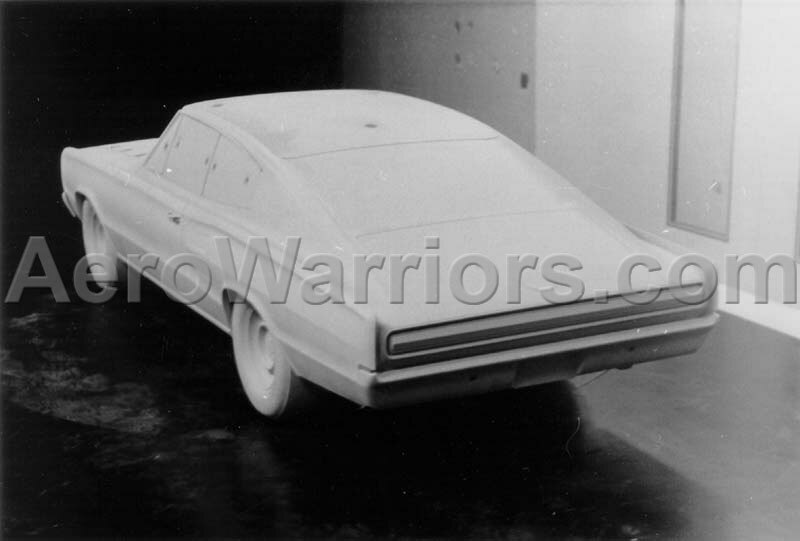 The 3/8 Dodge scale model began life as a 1968 Charger and was modified throughout the years to a standard 1969 Charger, 1969 Charger 500, 1969 Charger Daytona and 1970 Charger. 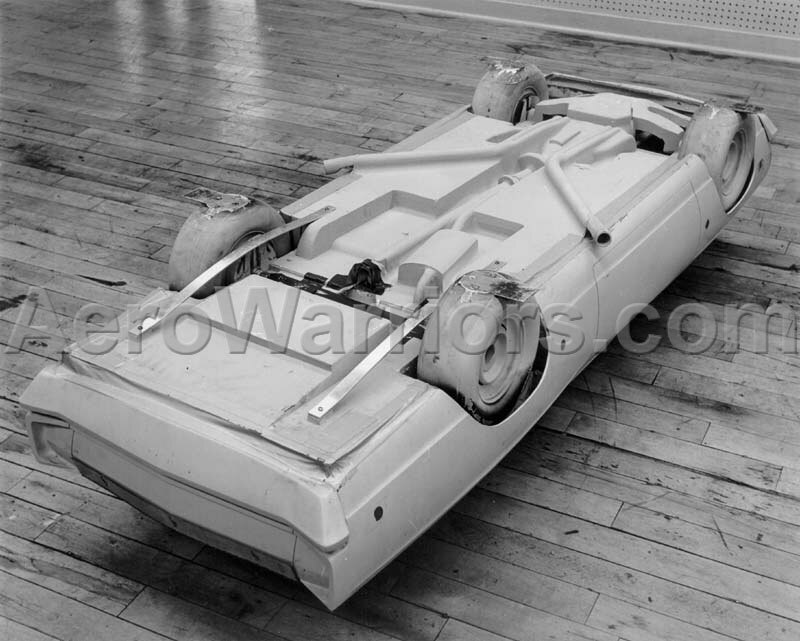 These photos document some rather radical aero modifications. 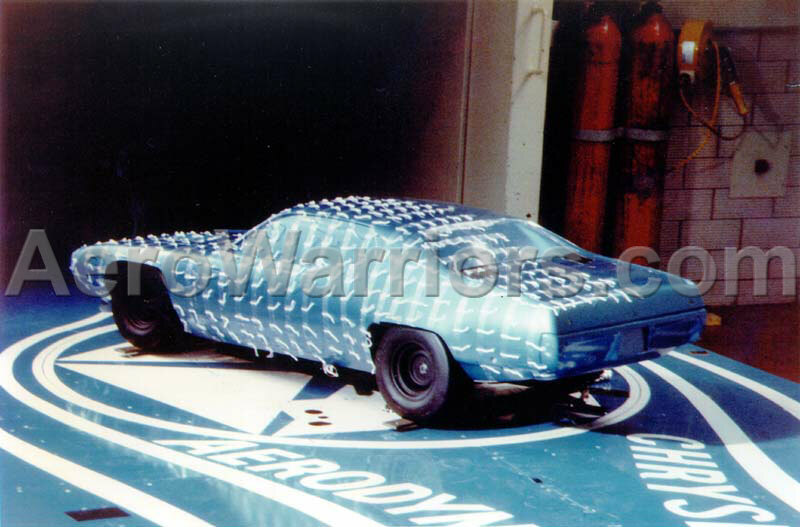 Notes on the rear of the first two photos from left indicate that strakes were being tested on the Charger and Road Runner. 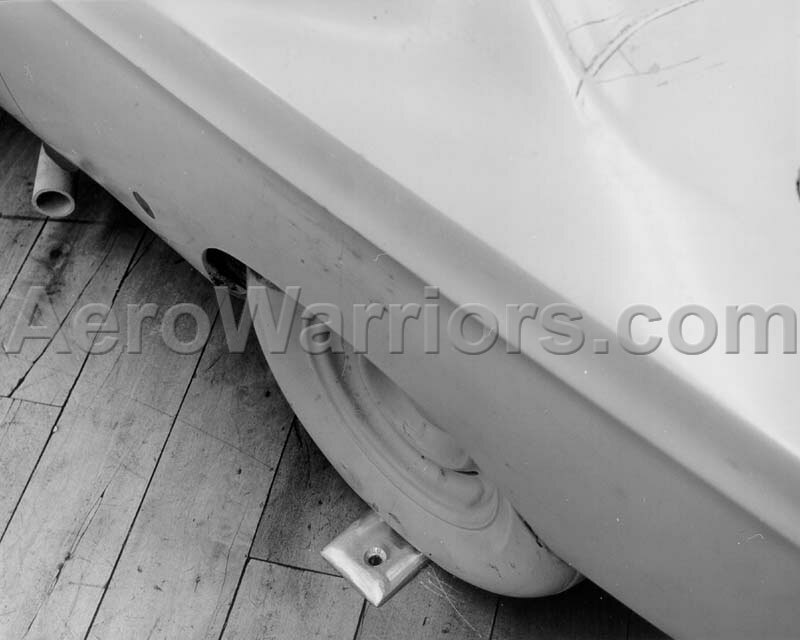 Strakes are aerodynamic devices used to influence air flow, and in this case they appear to be positioned below the rear quarter panels. 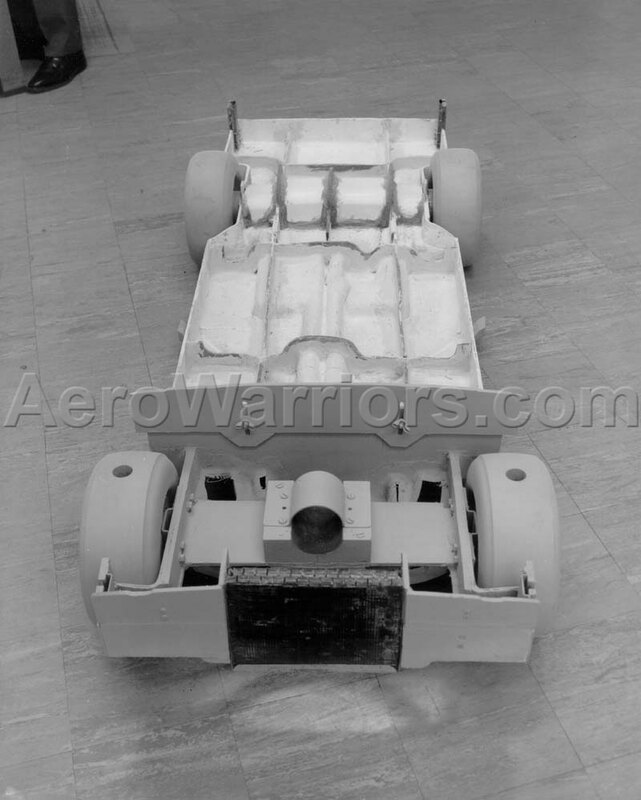 Photos three and four illustrate bumper manipulation - photo three carries the notation "Bumper raised approx. 1/2"". 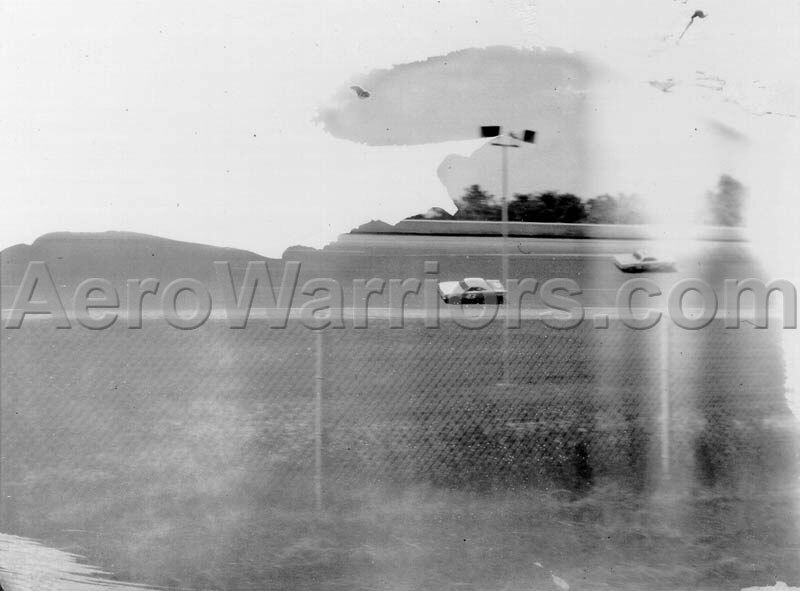 Writing on the back of photo four indicates that the bumper was rotated and lowered. 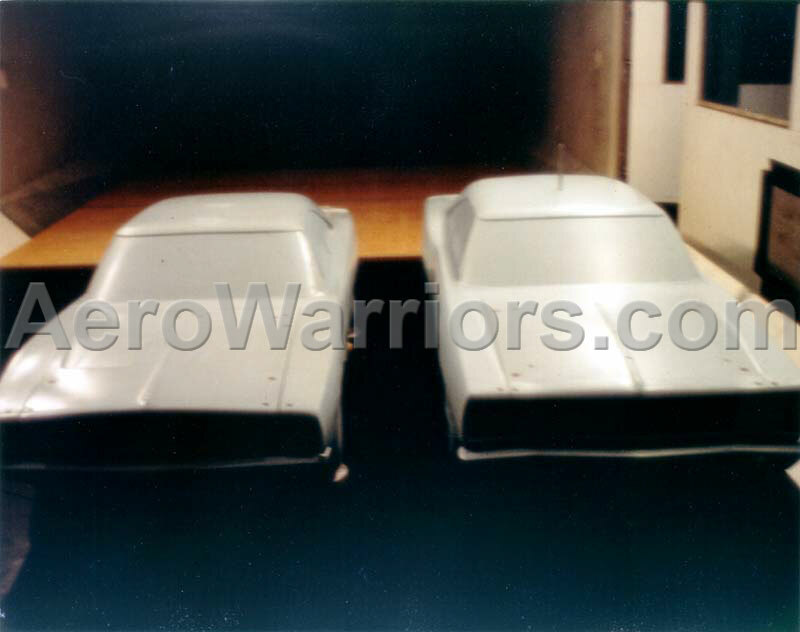 Front spoiler testing - from left to right respectively, photos have noted on the rear "Deflect. 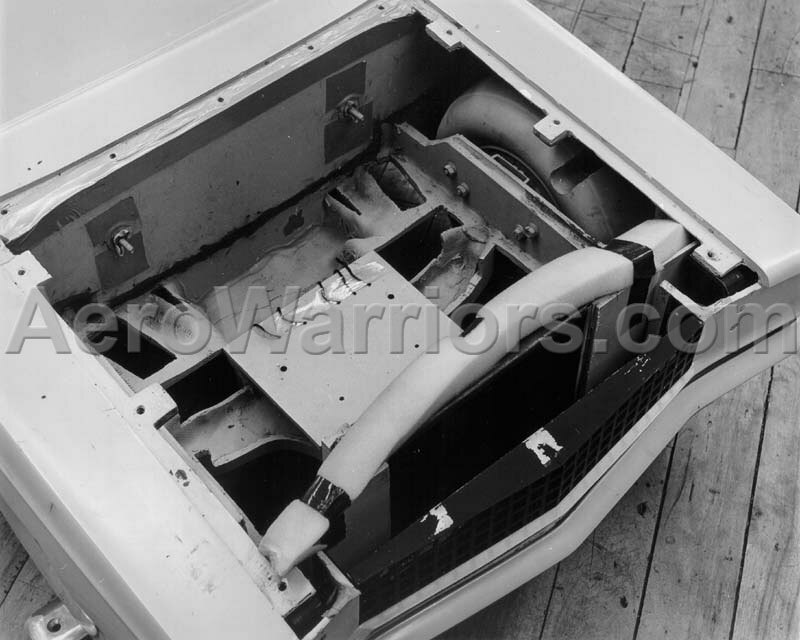 - #2", "Deflector #3" and "Deflector #4". 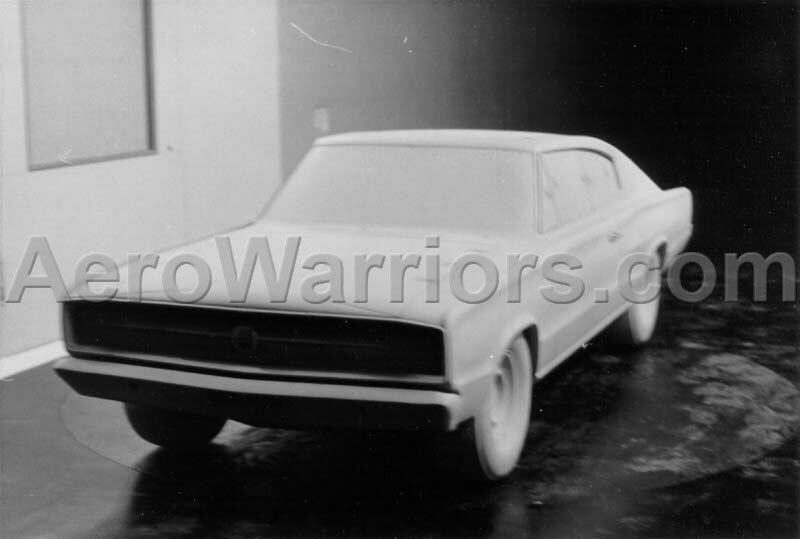 Rare color photos of 3/8 scale Charger and Coronet models during the development of the Charger 500 . As with the three sets of images just above, they were probably taken at the Wichita State University wind tunnel in Kansas. 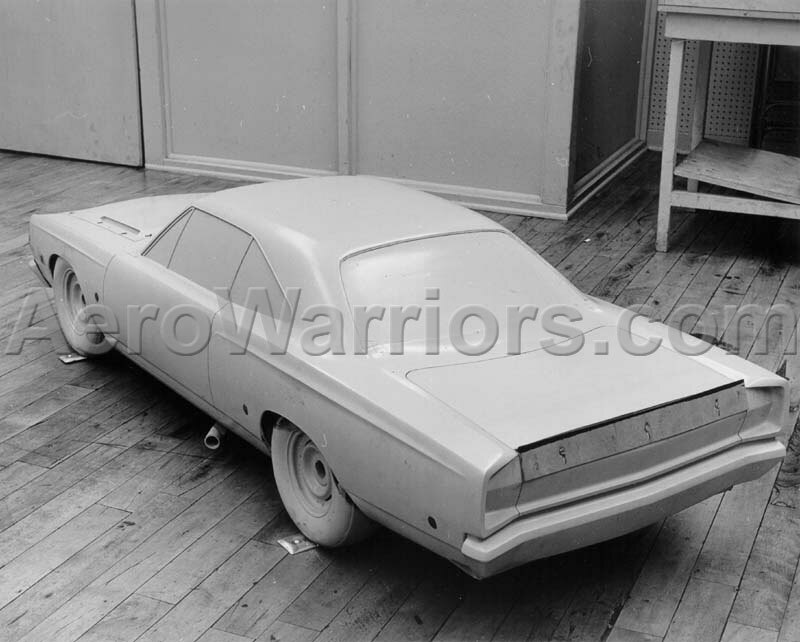 More rare color photos, this time of the 3/8 scale models used by Chrysler for testing its 1971 designs. 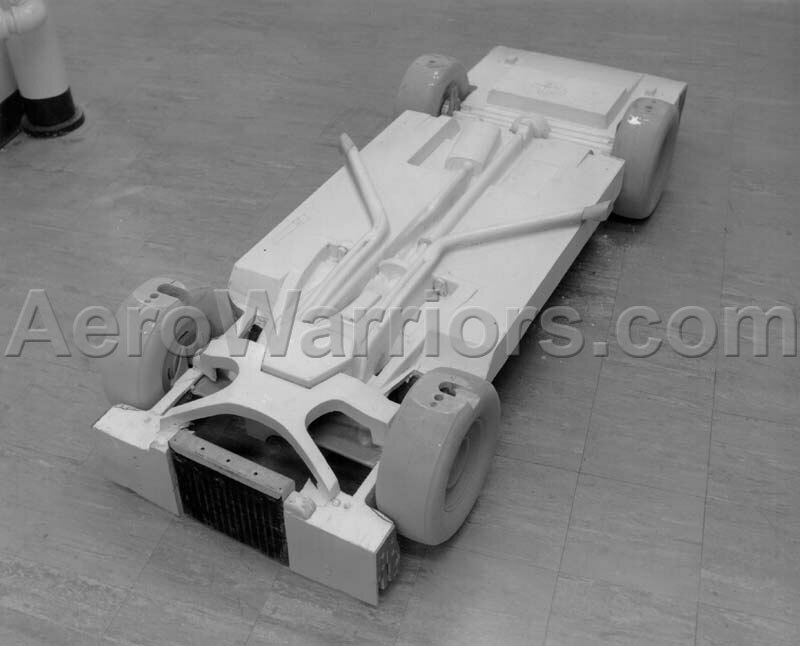 Extensive information on how these models were used is available on The G-Series Wind Tunnel Test Report page. 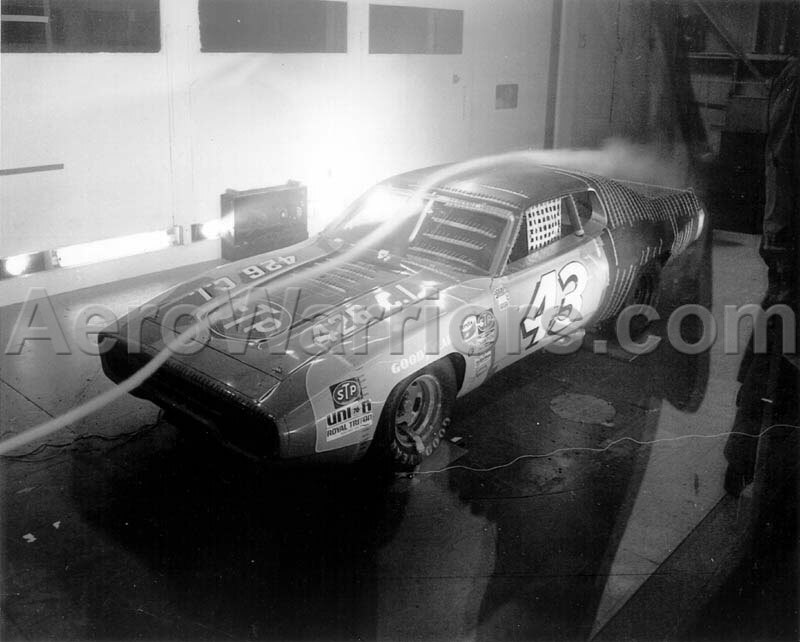 Wind tunnel testing of a 1972 Petty Road Runner. The smoke and tufts of yarn made it possible to easily observe just how air flowed around the car. 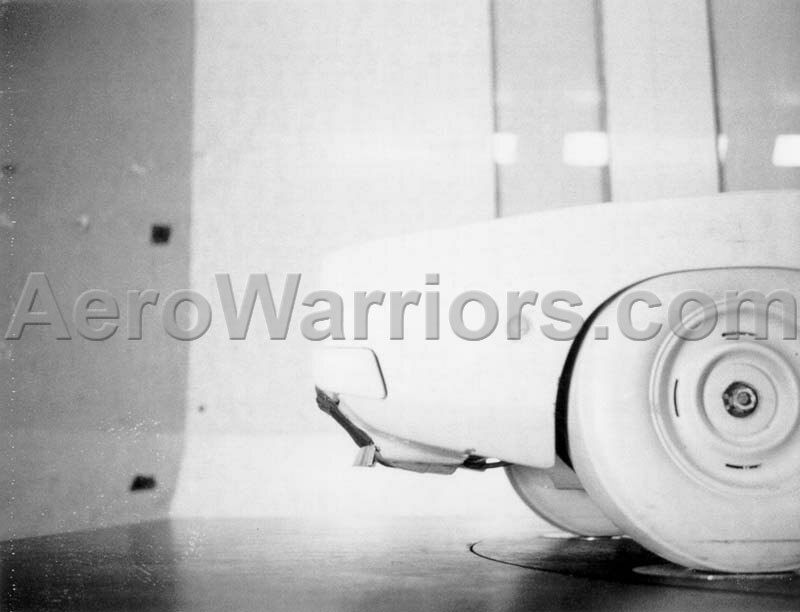 These photos were likely taken at the Lockheed wind tunnel in Marietta, Georgia. 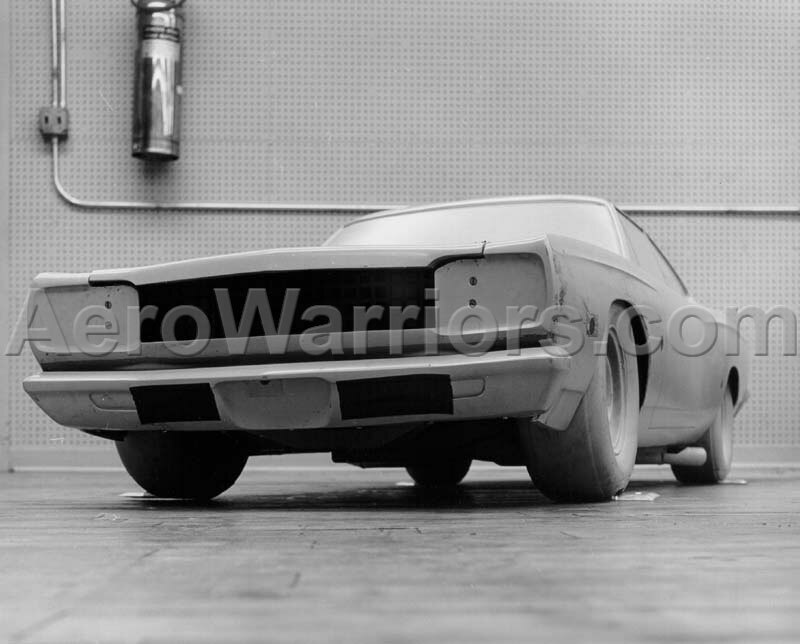 Petty would move to the more aerodynamic Dodge Charger body during the 1973 season.